If I seem star-struck—it's because I am :-0. Seeing this highly emblematic and eponymous Rolex Paul Newman Daytona this closely and intimately, would be like watching the most beautiful woman in the world, in movies and on TV, and in magazines, for years. Then all of a sudden, one day, she appears and is sitting in front of you, staring in your eyes—happily smiling at you. Seeing Paul Newman's actual Rolex Daytona in the flesh, this clearly & precisely, finally reveal all the details—unequivocally. All speculation and guessing games around the Paul Newman Daytona have finally come to an end...The vintage Rolex world now has achieved the truth with crystal-clarity around the previously enigmatic "Paul Newman Daytona." The facts have finally been separated from the fiction. As they say, "What a difference a day makes!" The obvious question is, what happened to Paul Newman's Daytona? What has Paul Newman's Trademark Daytona been doing for the past 32 years? Had it been lost in a river, or hiding in a drawer somewhere; or had Paul Newman lost it on a movie set or in a hotel? Had it been stolen, or given away to a mechanic of his? Or, was one of his daughters happily wearing it? 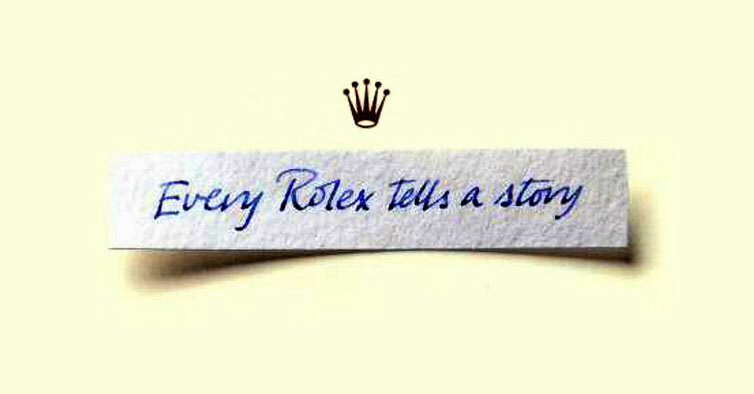 Every Rolex Tells A Story, and this is certainly one fascinating Rolex Story!!! Before I go into detail on Paul Newman's Daytona, let's first examine what makes this super-iconic Rolex watch really tick. 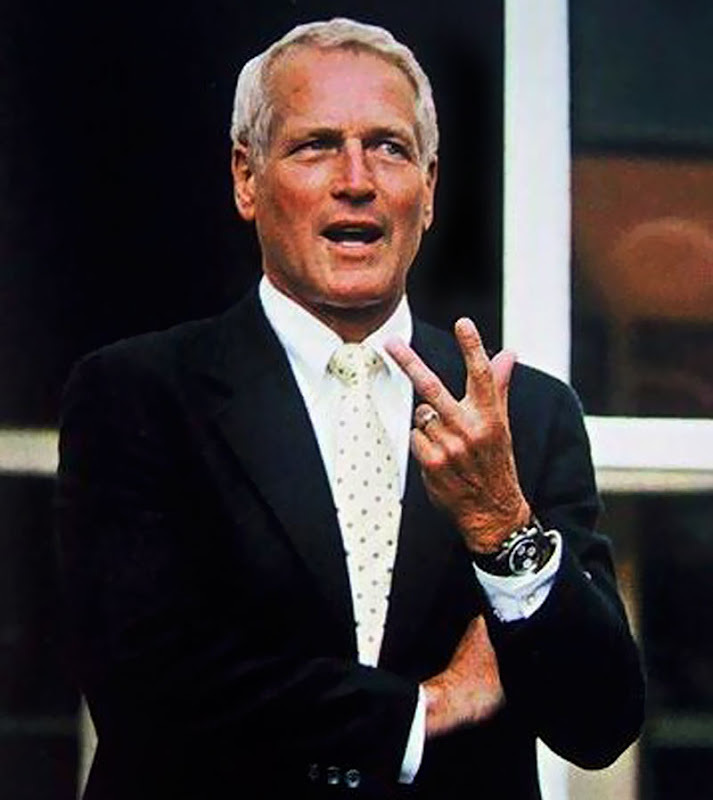 In the past, I have written extensively about Paul Newman's Rolex collection. As a matter of fact, I would say my 8 Part series named: "The Complete History Of The Paul Newman Daytona" is THE DEFINATIVE STORY on Paul Newman's Daytona. 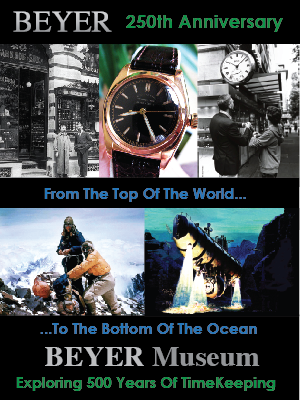 My story offers a complete and comprehensive overview of Paul Newman's love of wearing Rolex watches. In my Paul Newman story, I chronicled Paul Newman wearing 6 different Rolex Daytona models, as well as a Platinum Rolex Day-Date, and a stainless steel Rolex Datejust. Joanne Woodward gave her husband Paul Newman this Rolex Daytona watch as a gift in 1972, when he began his professional racing career. At the time she paid around $300 for it. In order to best understand the significance of Paul Newman's Daytona, we need to climb in The Rolex Time Machine and go back to 1961. In 1961, Paul Newman co-starred with Jackie Gleason in the cult-classic named The Hustler. 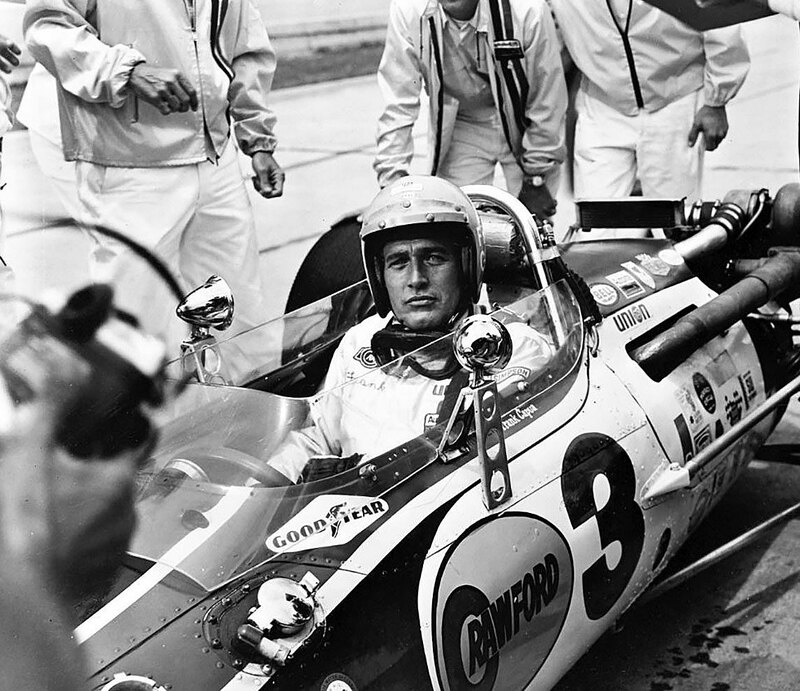 At the time, Paul Newman was an up-and-coming super-star that was beginning to burn very brightly. Jackie Gleason played Minnesota Fats in The Hustler, and Paul Newman played the role of Fast Eddie Felson. Piper Laurie played Sarah Packard, and George C. Scott played Bert Gordon. 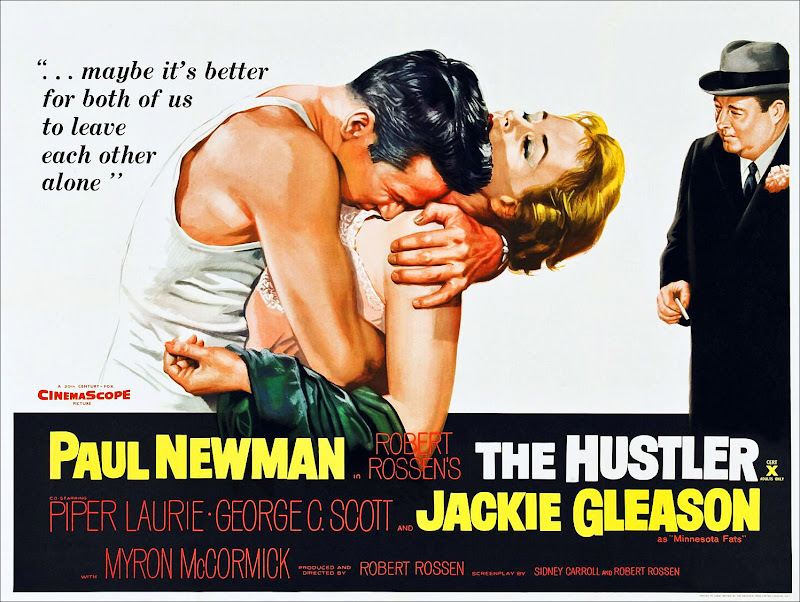 The Hustler was nominated for 9 Academy Awards and won the awards for Best Art-Set Decoration and Best Cinematography. 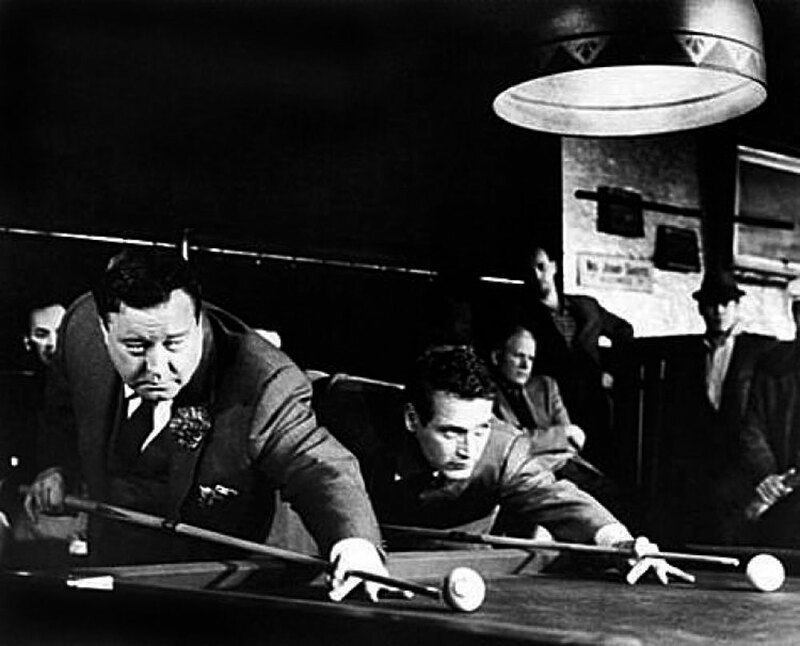 Jackie Gleason and George C. Scott were both nominated for Best Actor In A Supporting Role. 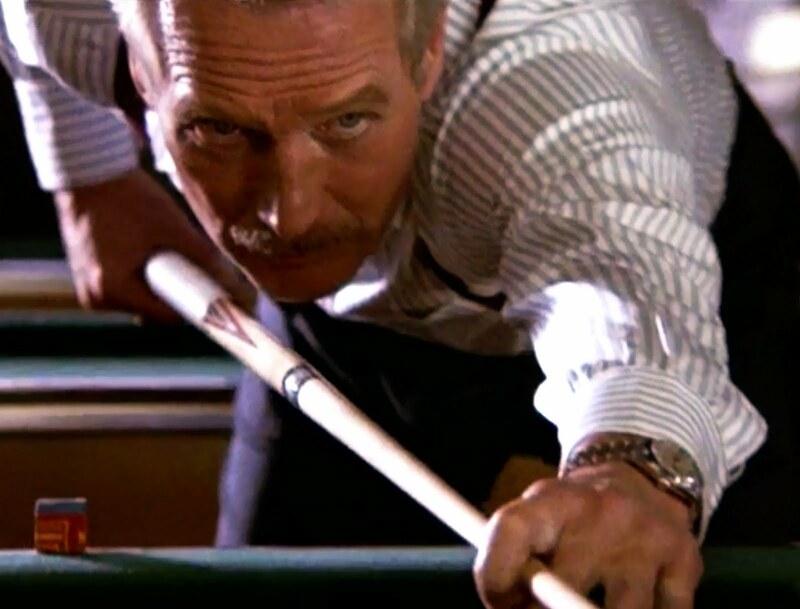 The Hustler was responsible for creating a resurgence of the popularity of pool in the U.S.
1969 was a very good year for Paul Newman. 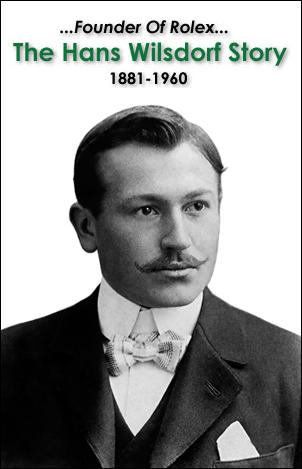 He came out with two very successful movies that year. 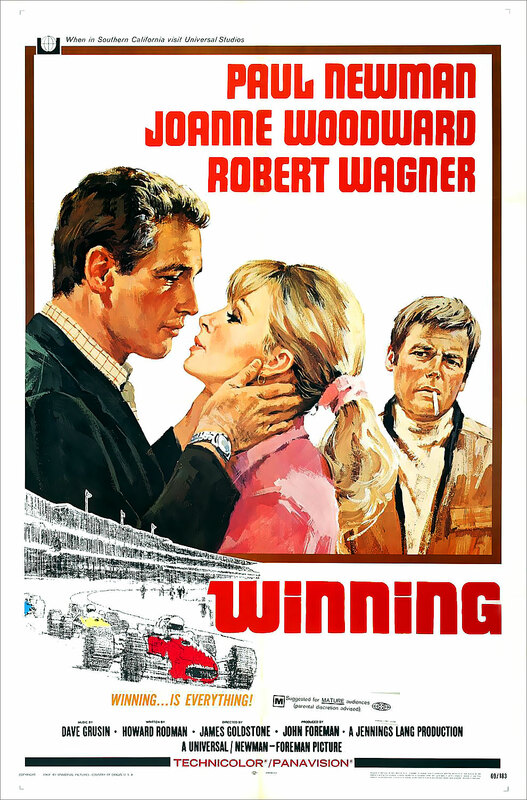 The first was a movie about a race car driver that was played by Paul Newman, and his wife Joanne Woodward costarred next to him. 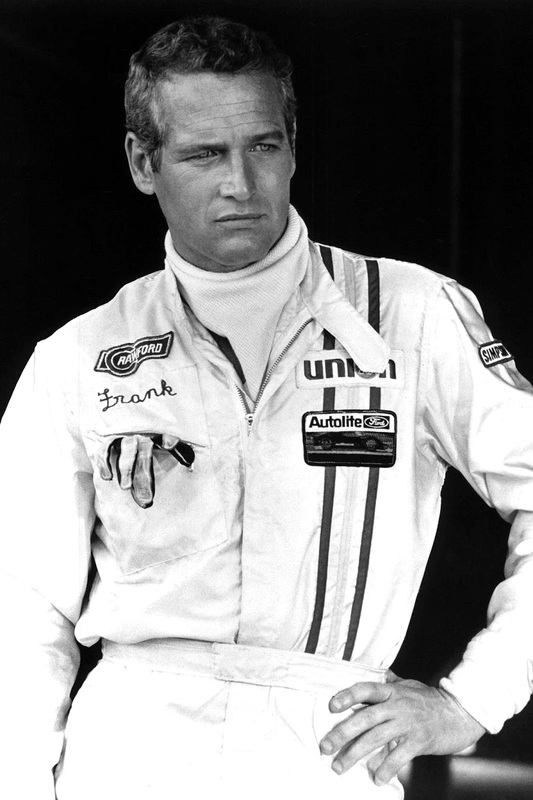 Paul Newman was so inspired by making the racing movie, "Winning" it lead him to become a professional race-car-driver in real life. 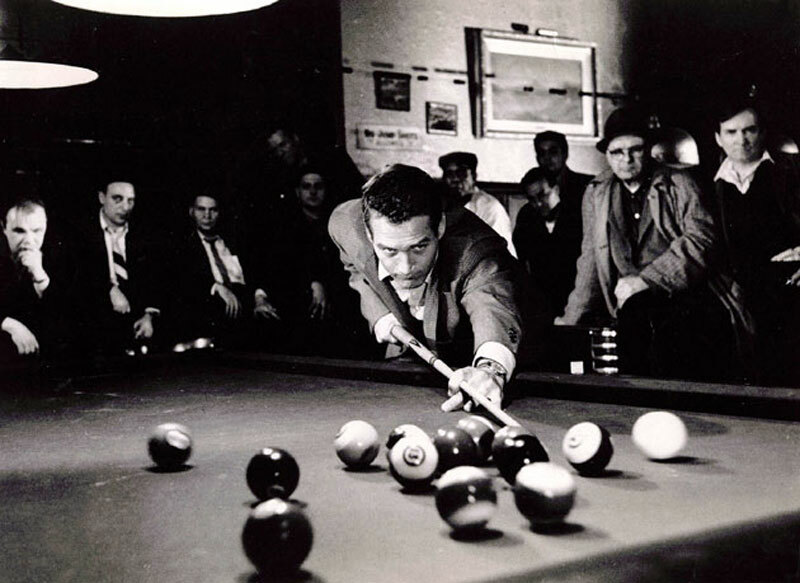 Paul Newman is pictured above and below in a publicity shots from the movie Winning. A false myth has been circulating for many years now, that I busted a long time ago, and it said that Paul Newman wore a Rolex Daytona in the movie, Winning and that is where the name, "Paul Newman Daytona" came from. This is a clearly a case of mistake identity, (Pun Intended ;-). 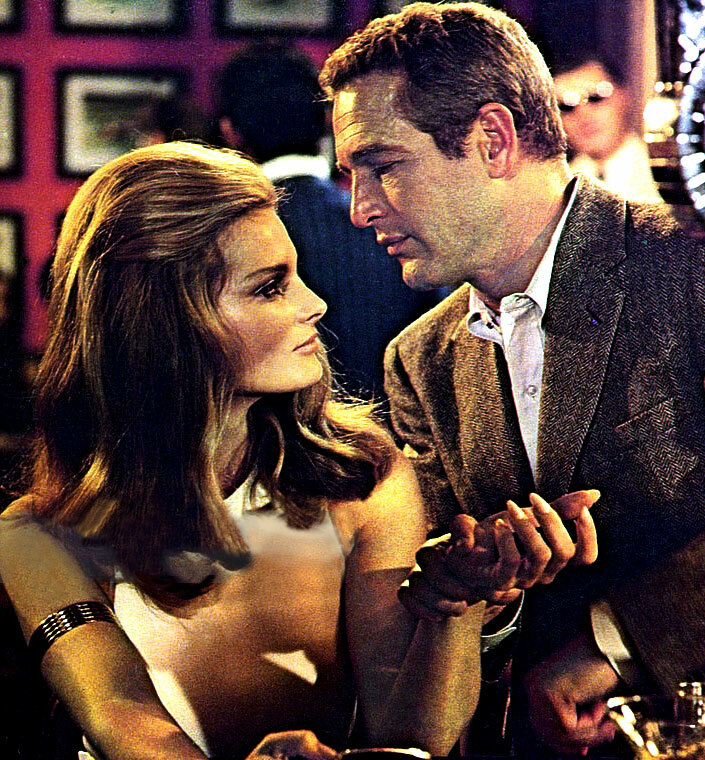 Although Paul Newman wore a stainless steel chronograph in that movie, it was NOT a Rolex. 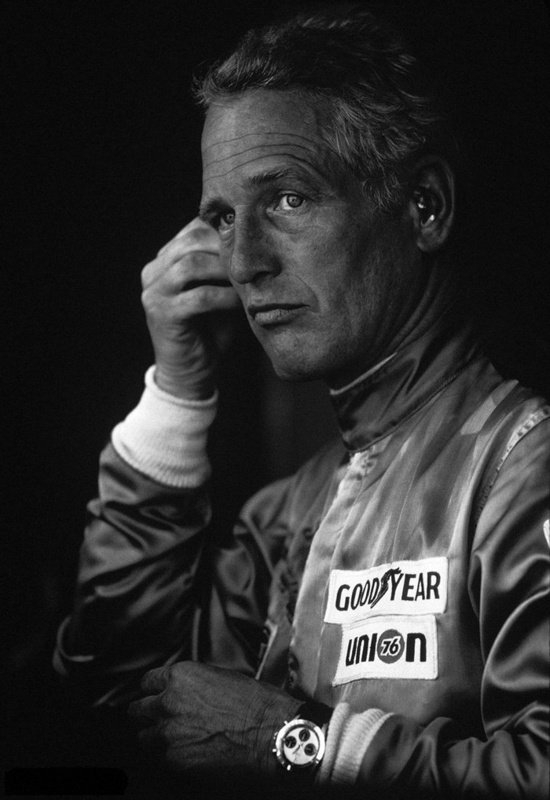 In the publicity shot below from Winning, we see Paul Newman wearing an unidentifiable Chronograph, and we see how it was possible for some people to confuse as being a Rolex Daytona, but the best evidence suggests otherwise. 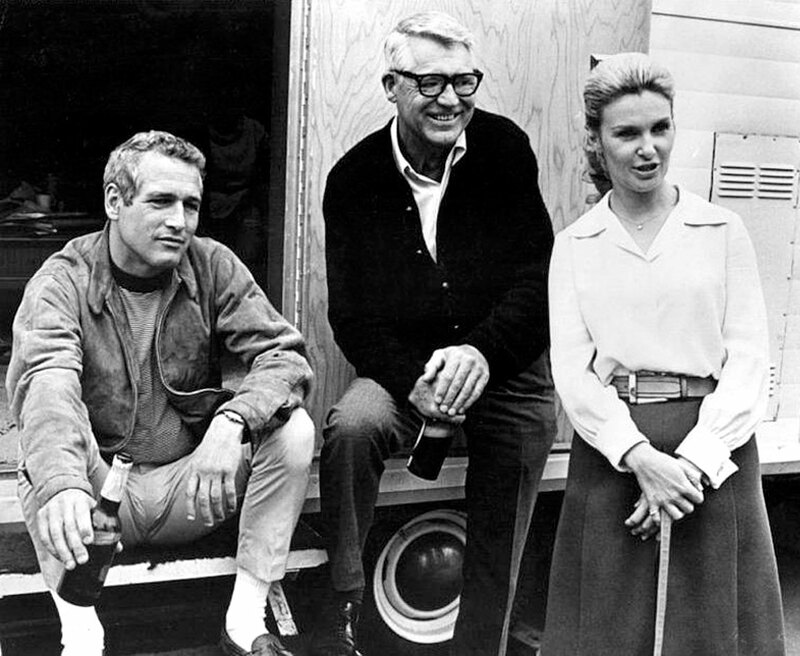 This is a great photo of Paul Newman with Cary Grant and Joanne Woodward on the set of "Winning" in 1969. Cary Grant and Paul Newman are considered two of the most successful, best looking actors in history, and in the photo it is so cool to see them kicking it together enjoying a bottle of beer. You can watch 'Winning] on Youtube, but it is broken up into 6 parts. Here is part 1 if you want to get an idea of its vibe. 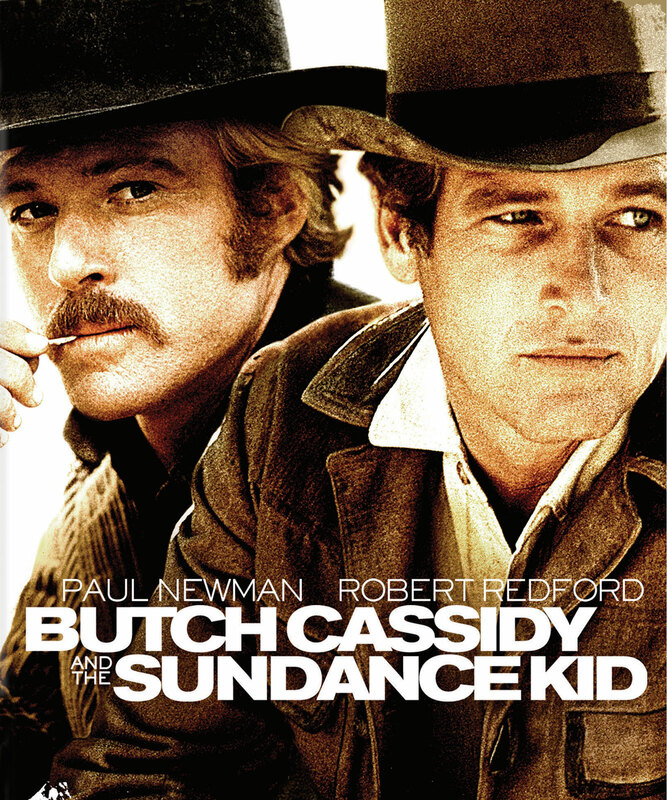 Another seminal Paul Newman movie also debuted in 1969, named Butch Cassidy & The Sundance Kid, which costarred Robert Redford. 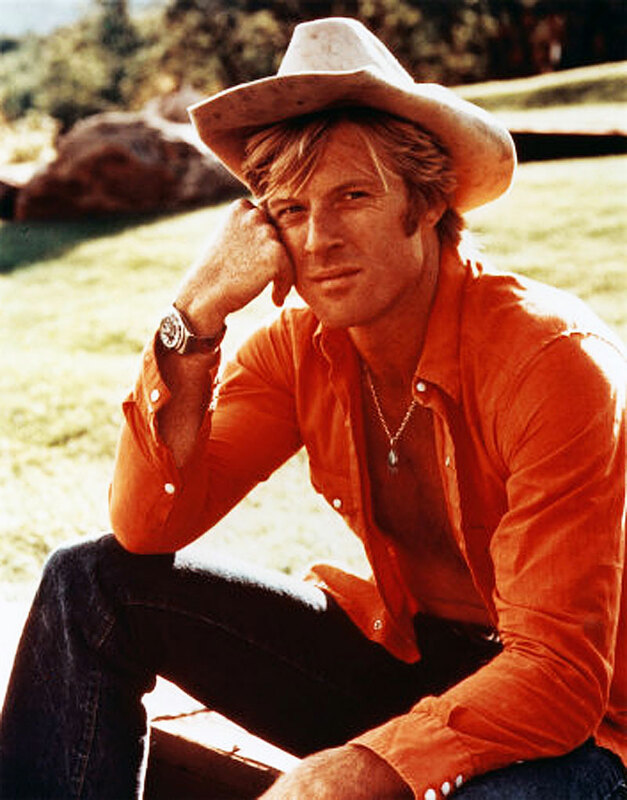 Of course, Robert Redford famously wore his trademark Rolex Submariner which is pictured on his wrist in the photo below. 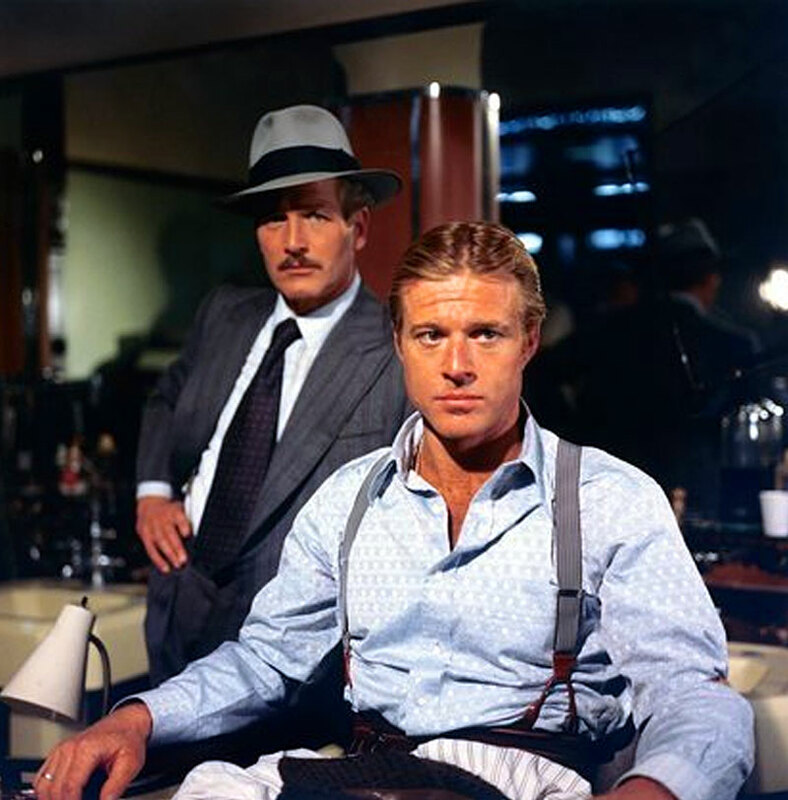 Paul Newman and Robert Redford would successfully return to the silver screen in 1973 to co-star beside each other in blockbuster hit titled, The Sting. A short year later, in 1974, Paul Newman would costar with The King Of Cool, Steve McQueen in the movie titled, "The Towering Inferno." 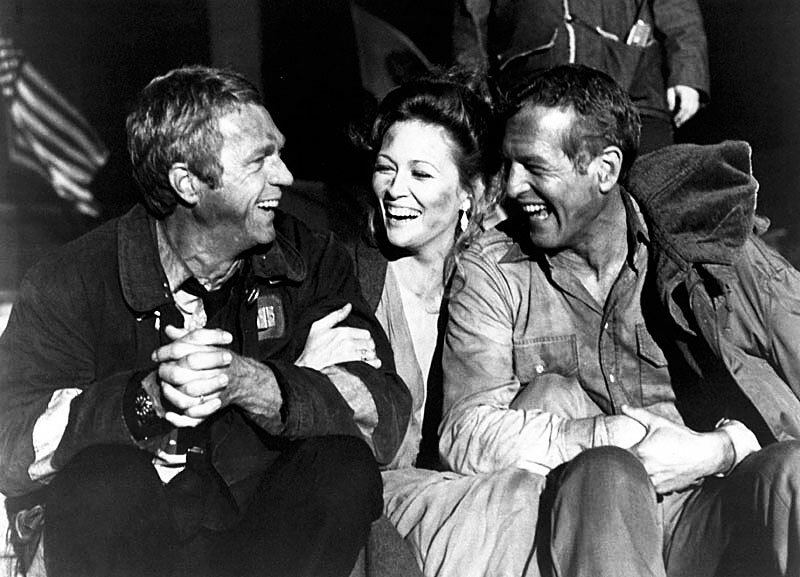 In the photo below we see Steve McQueen, Fay Dunaway, and Paul Newman sharing a good laugh on set during the filming of The Towering Inferno. 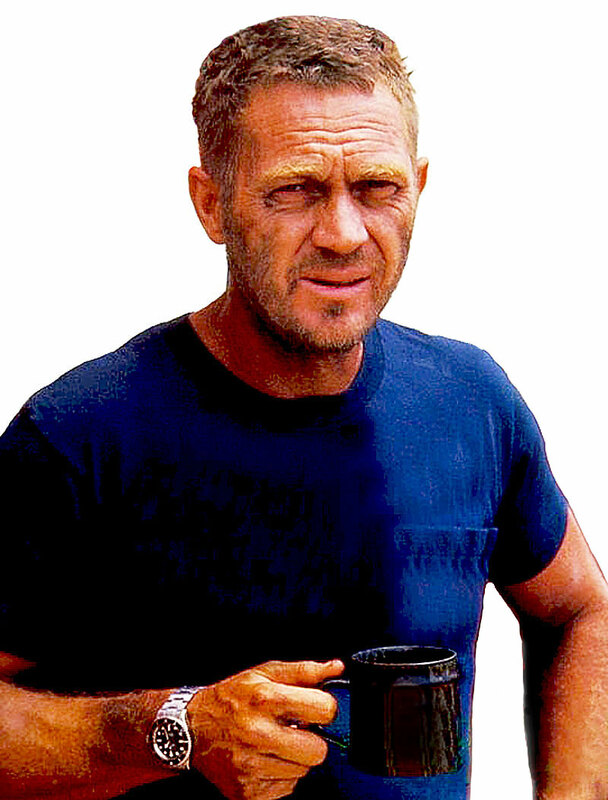 Steve McQueen, like Robert Redford, also wore a Rolex Submariner as seen on his right wrist in the photo above and below. 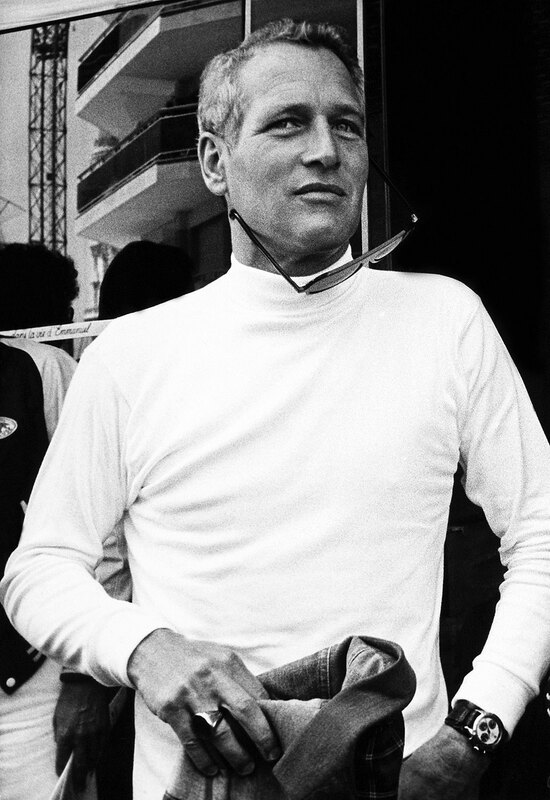 Steve McQueen was good friends with Paul Newman, and they shared a love of racing cars, and Rolex watches. 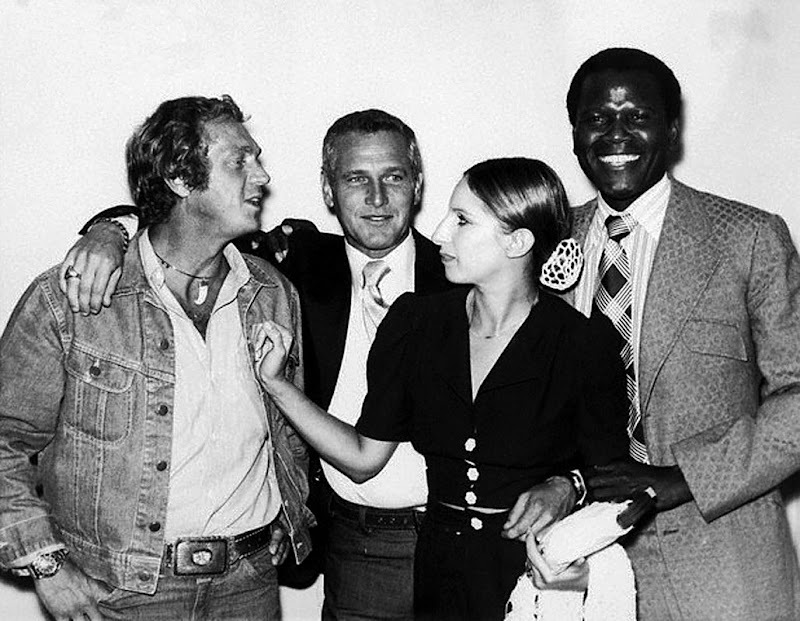 In the photo below, taken in 1969, we see Steve McQueen, Paul Newman, Barbra Streisand, and Sidney Poitier when they were announcing the formation of First Artists Production, which would be their own movie production company. 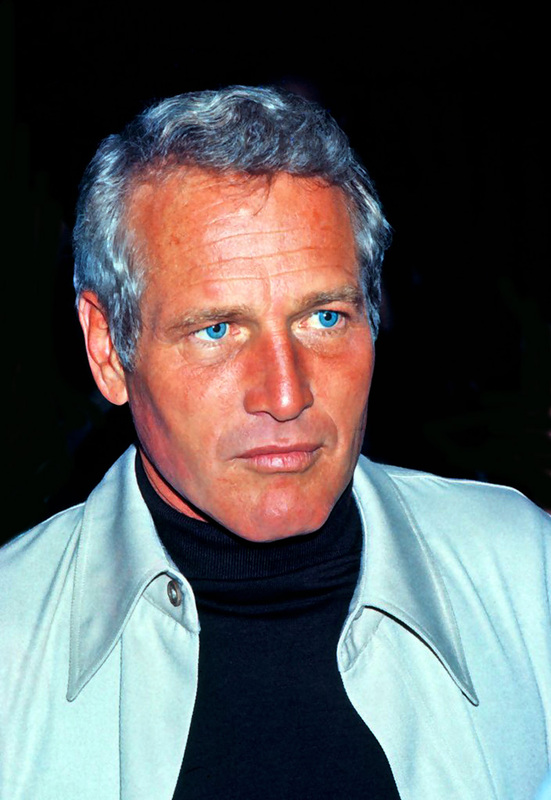 A question that comes up a lot, is, who was cooler: Paul Newman or Steve McQueen? This question inevitably ends up being a Coke v. Pepsi question, but it is worth noting Steve McQueen began his racing career, and was wearing his Rolex Submariner long before Paul Newman. This fact is particularly interesting in the sense Steve McQueen and Paul Newman began their acting careers at the same time, as did James Dean. All three actors attended The Actors Studio in New York City, and Paul Newman went on to become the President of the organization. 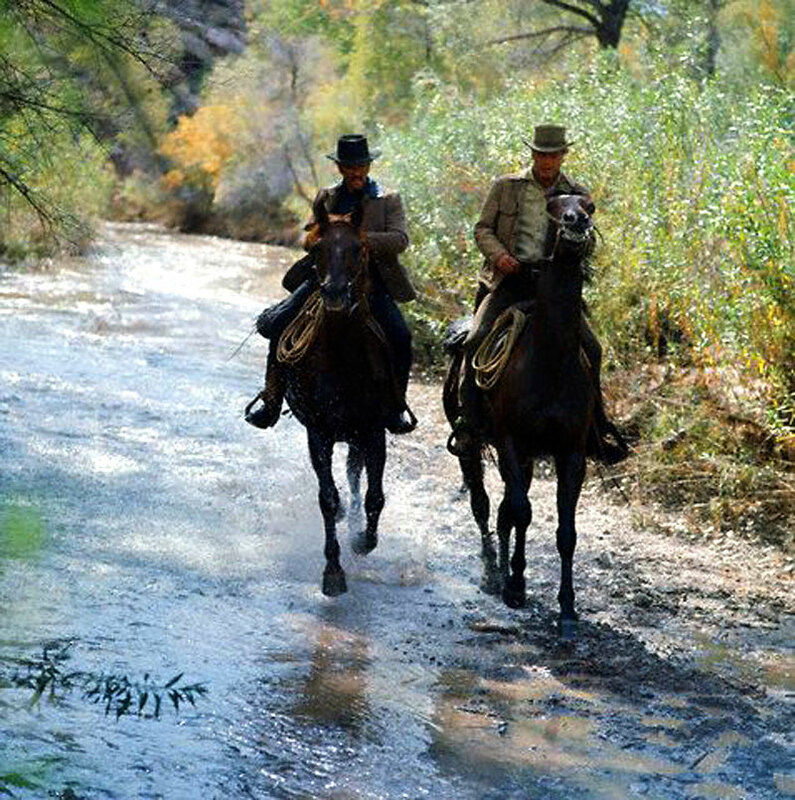 Steve McQueen and Paul Newman appear in the screen shot below from the movie, "Somebody Up There Likes Me." Paul Newman was five years older than Steve McQueen, and his career took off faster than Steve McQueen's, so it was thought that Steve McQueen looked-up to Paul Newman, but in some ways, it was clearly the other way around. 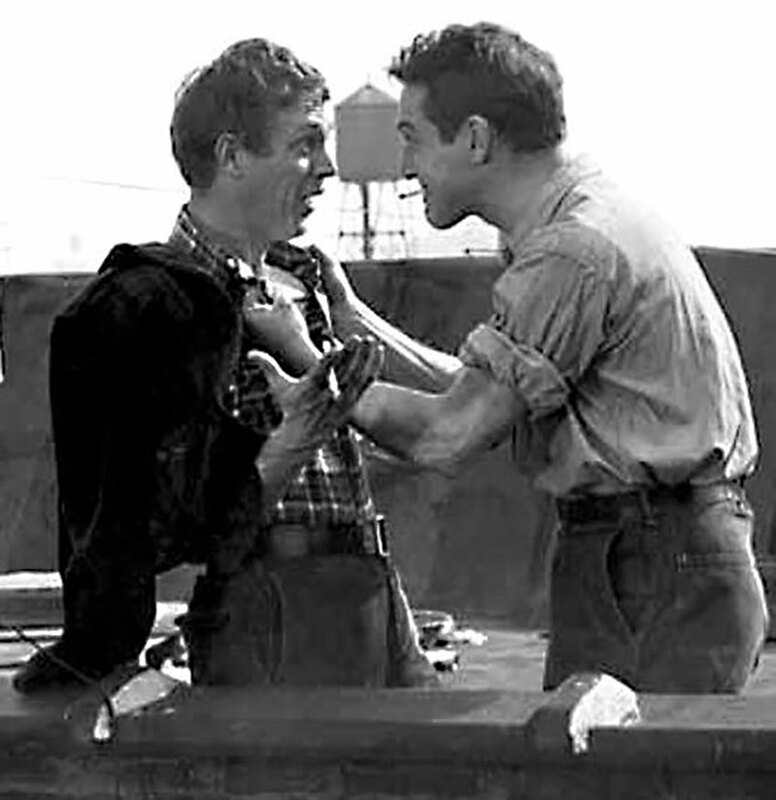 Both Paul Newman and Steve McQueen had a very competitive relationship. Below is the original 1956 movie trailer from "Somebody Up There Like Me", which was about the career of the great boxer, Rocky Graziano's. 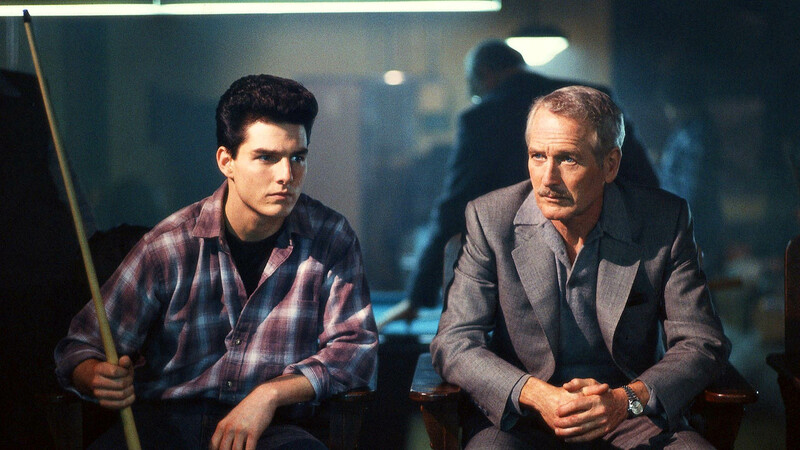 In 1986, Paul Newman would reprise his role as Fast Eddie Felson in the movie, The Color Of Money, for which he won an Academy Award for Best Actor. 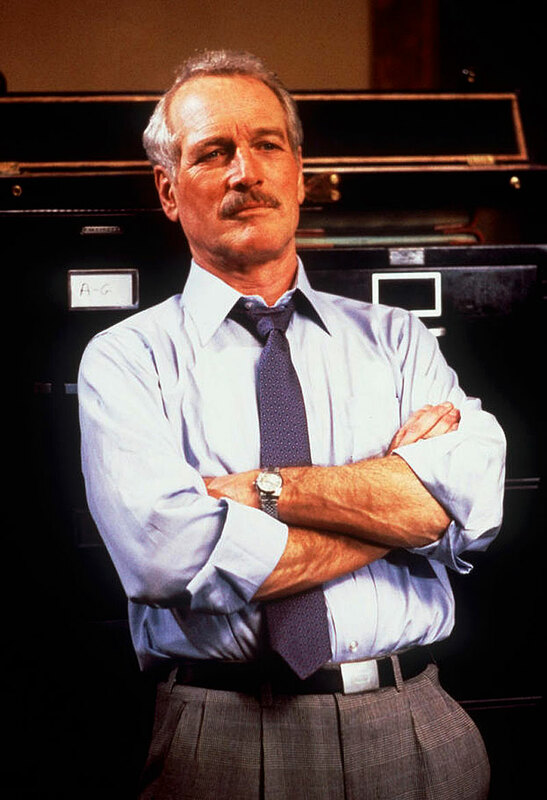 In the movie, The Color Of Money, Paul Newman's character, Fast Eddie Felson's character wears a stainless steel Rolex Datejust on a Jubilee bracelet, as seen in the photo above & below. 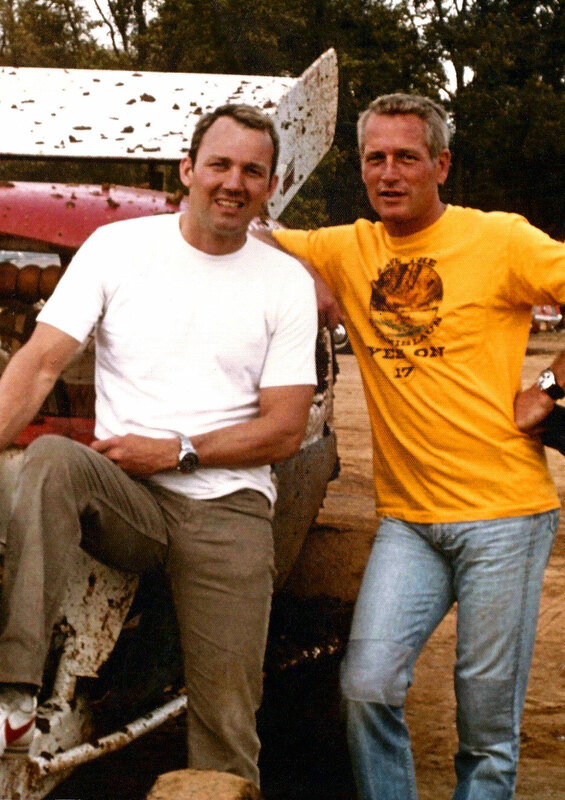 So what happened to Paul Newman's Daytona after it mysteriously disappeared from his wrist in 1985? The photo below shows Paul Newman on March 24, 1986, and shows Paul Newman accepting an Honorary Oscar via Satellite on the set of the major motion picture titled, "The Color Of Money". 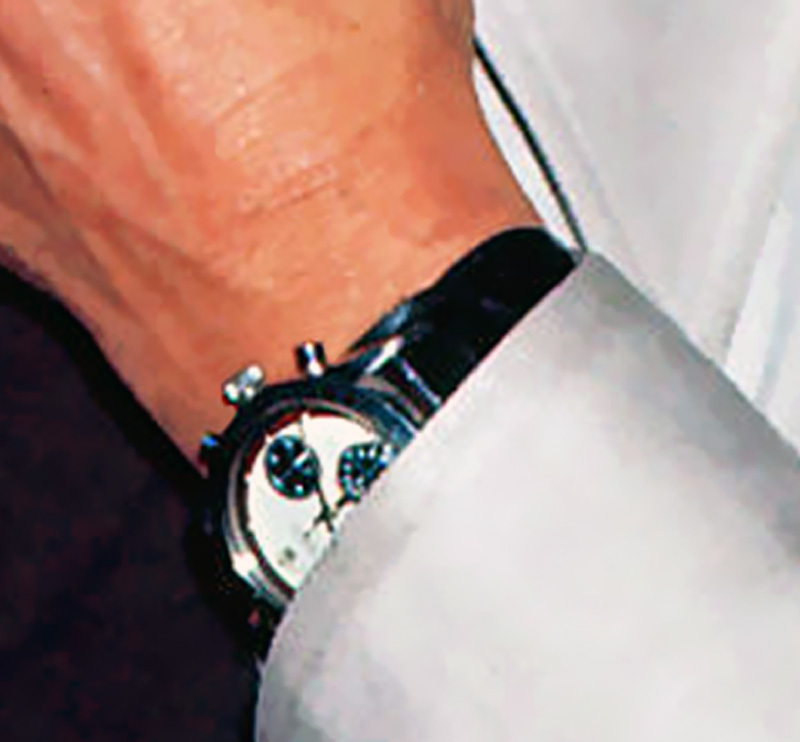 As seen in the photos above, Paul Newman famously wore a stainless steel Rolex Datejust in that movie, and if he gave away his trademark Exotic Dial White Dial Daytona he wore on a crocodile FatStrap a year earlier, then what is he doing wearing it in this 1986 photo? He isn't wearing it. He is wearing a different Rolex Daytona. This one, if you look closely has a black dial, with a matching black bezel, as apposed to his more trademark exotic white dial Daytona, which had a steel bezel. 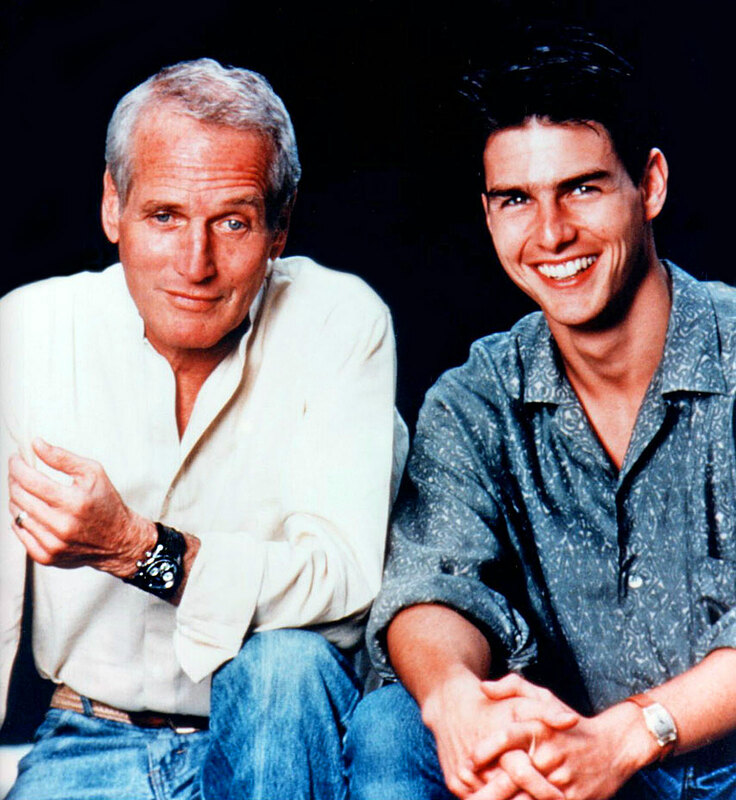 In the photo below with his co-star from The Color Of Money, Tom Cruise, again Paul Newman is wearing his Black Dial Daytona which has a reference number of 6263. 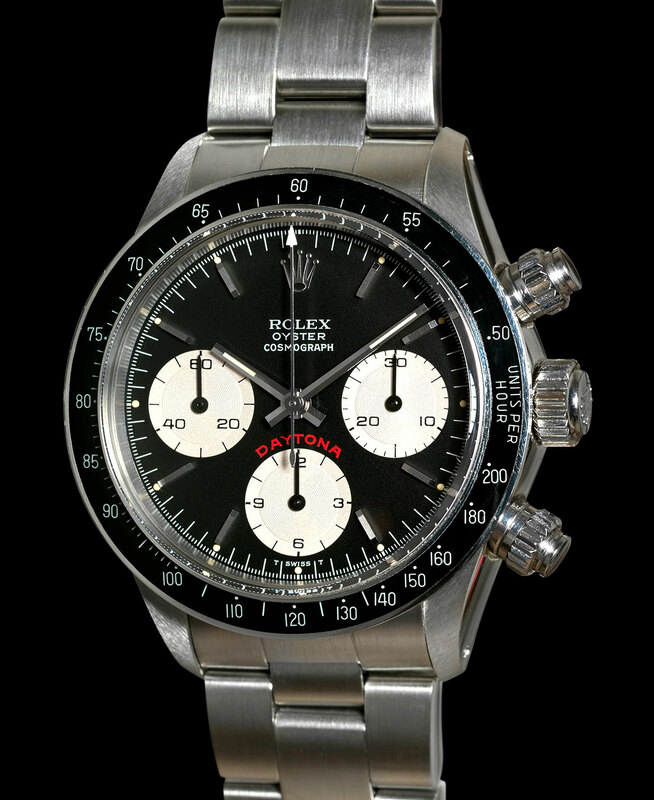 The stainless steel Rolex Daytona [Reference 6263] with the black dial and black bezel insert that Paul Newman is wearing in the photos above would look just like the one pictured below. Some of these models are referred to by collectors as "Big Red", since the Daytona has such a large 'Cherry Red' logo. You can learn much more about many of the different Rolex Daytona models by checking out my story named, "The Complete History Of The Rolex Daytona Cosmograph." Notice this watch has screw-down protectors on the two chronometer buttons, unlike the 6239 with the white dial we already examined. 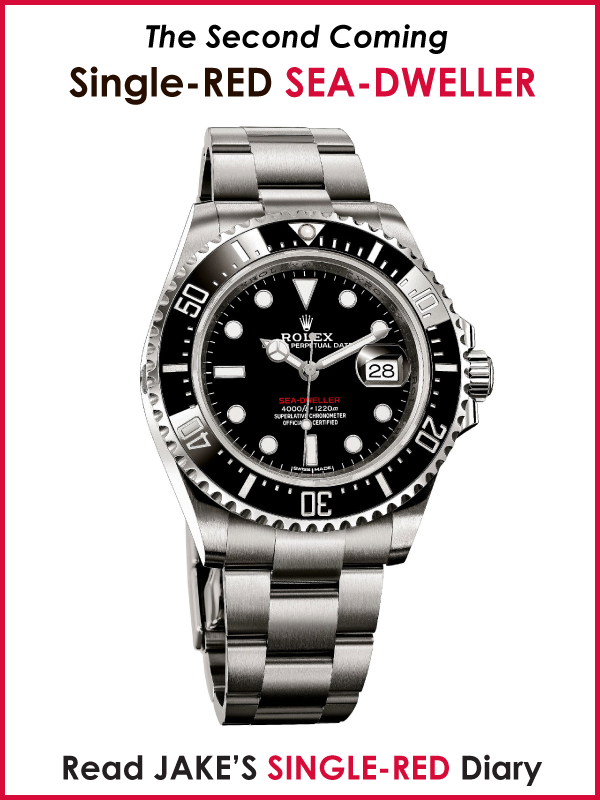 For clarity sake, the photo above is NOT of Paul Newman's watch. I just want to give you a visual frame-of-reference for what it looks like close-up. 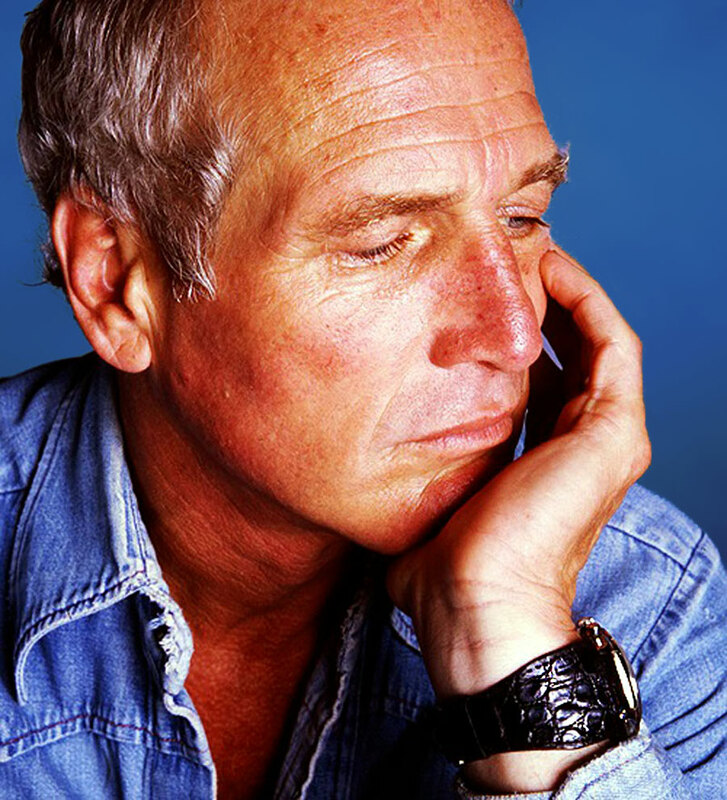 Paul Newman wore his black dial Daytona literally until he passed away on September 26, 2008. 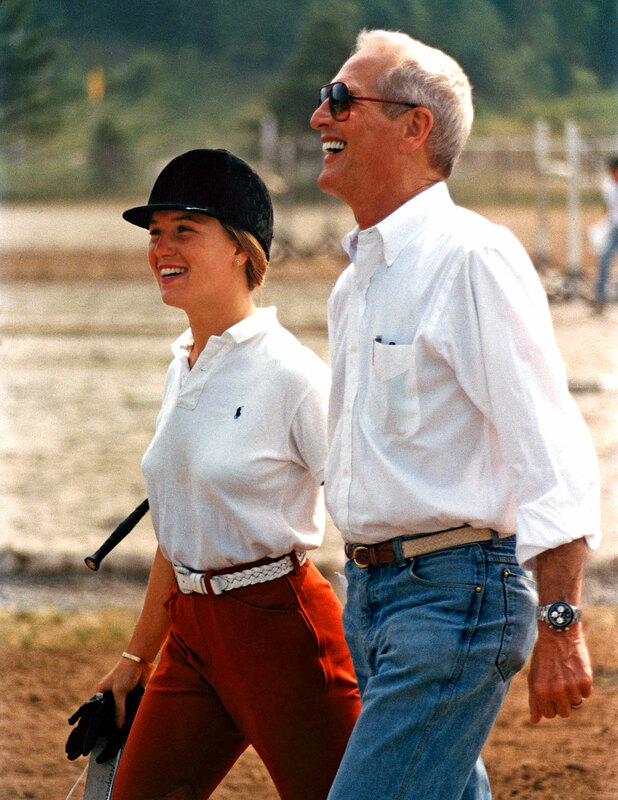 In the photo below we see Paul Newman walking with his daughter Clea Newman in 1988, and Paul is wearing his black dial Daytona on an Oyster Bracelet. 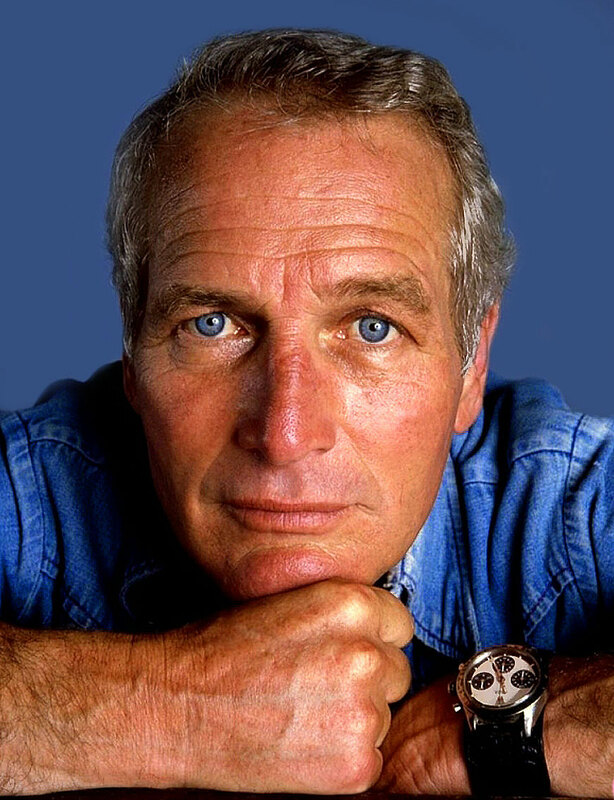 If you look closely at every photo of Paul Newman wearing his black bezel/dial Daytona [Reference 6263] you will notice he ALWAYS wears it with the chronograph push protectors unscrewed. 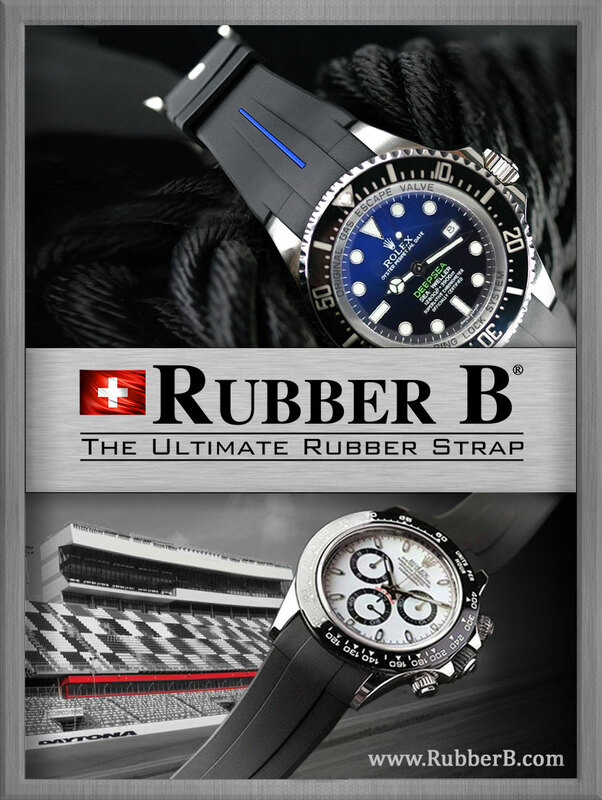 I believe this was he got so used to wearing his original exotic white dial Daytona, which lacked screw-down protectors, that he would simply leave them unscrewed. Just to be clear, the original Daytona watches had simple push buttons for the Chronograph function buttons. 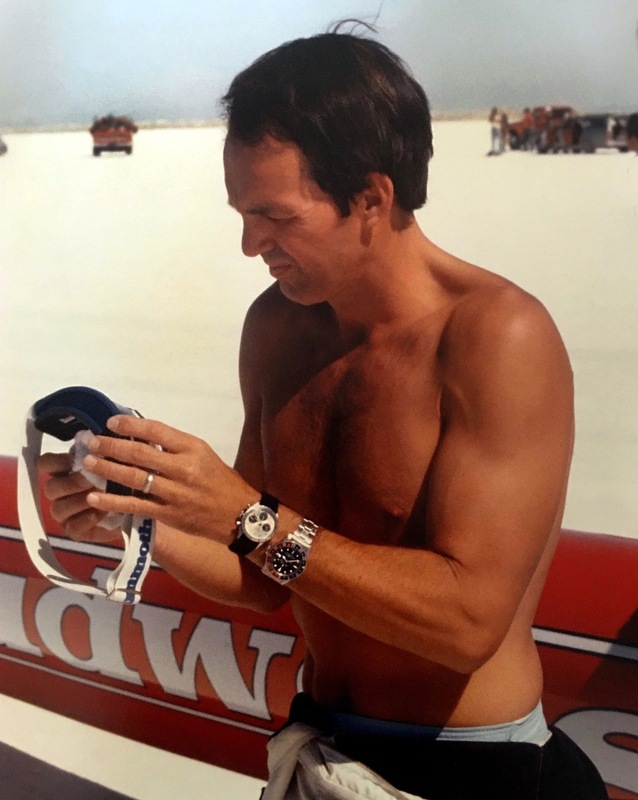 In later models, like the one seen below on Paul Newman's wrist, they added screw-down protectors to keep the push buttons more water-tight/ water-proof. Modern Rolex Daytona models still have this feature, which is a pain, as you have to unscrew the the protector, every time you want to use the Chronograph function, and when you are done using the Chronograph, you have to screw them back down. Also, from all the photos it looked like Paul Newman typically did not screw down the Oyster winding crown either. This was due to the fact both his exotic white dial as well as his black dial Daytona models were manual wind watches, and Paul knew that there was a gasket in the watch winding crown that would protect it from water, and dust, sweat and dirt, even if the crown was not screwed down, so he simple left them unscrewed all the time to make they much easier to wind. 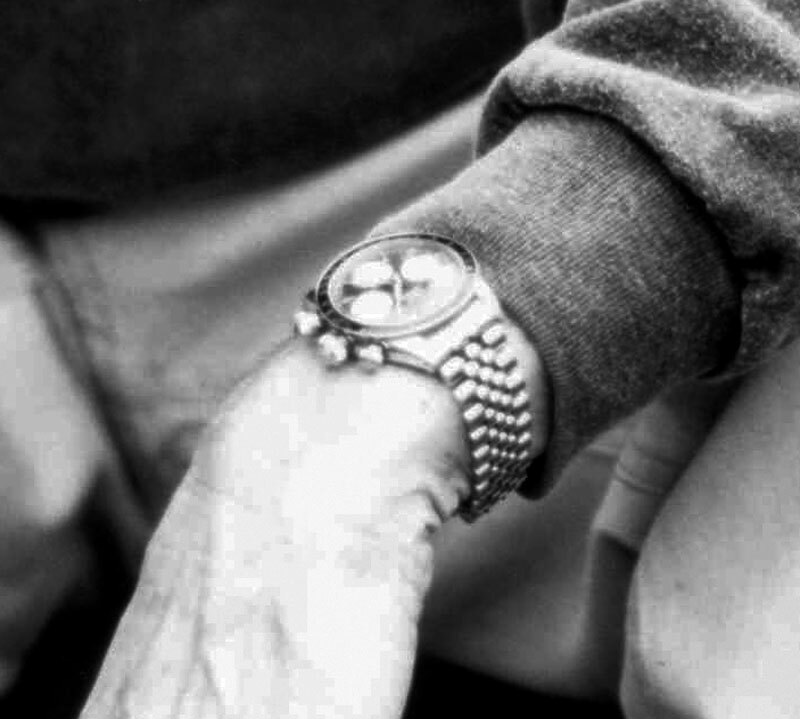 In the photo above and below, taken late in Paul Newman's life we see him wearing his black dial Daytona on a Rolex Jubilee bracelet. 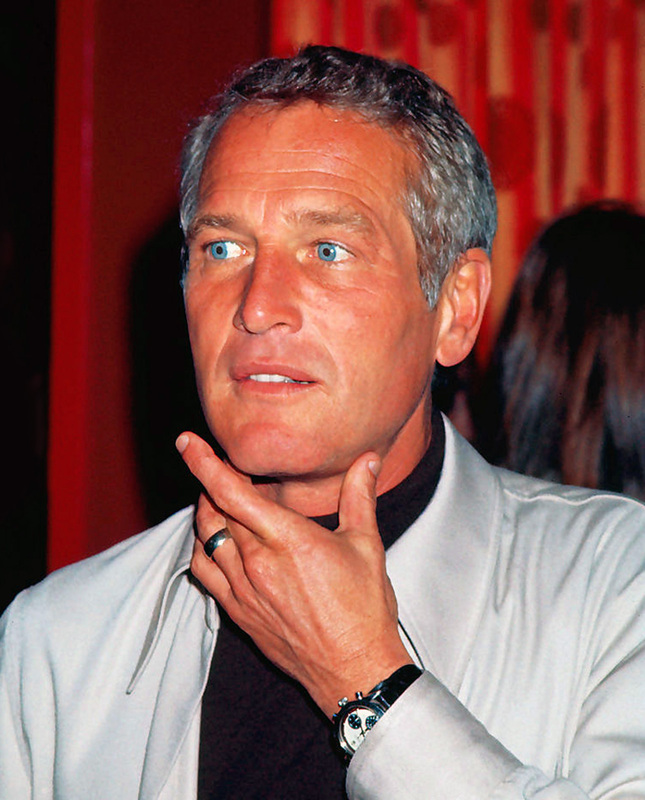 One thing is for certain, and that is the fact Paul Newman experimented like crazy with wearing different straps and bracelets on his Rolex Daytona watches. 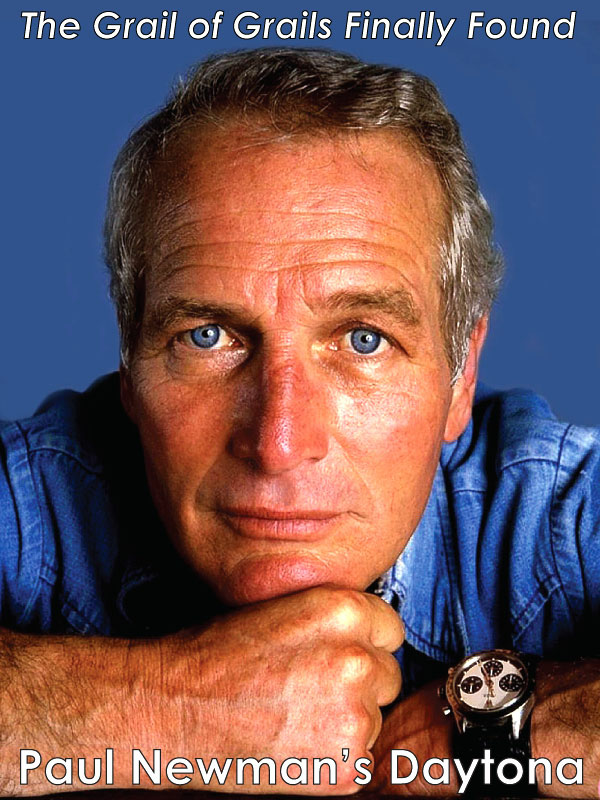 As I mentioned earlier in the story, I began hunting for Paul Newman's Exotic Dial Daytona more than a decade ago, and last year when I interviewed Paul Newman's daughter, Nell Newman I finally discovered it's whereabouts. 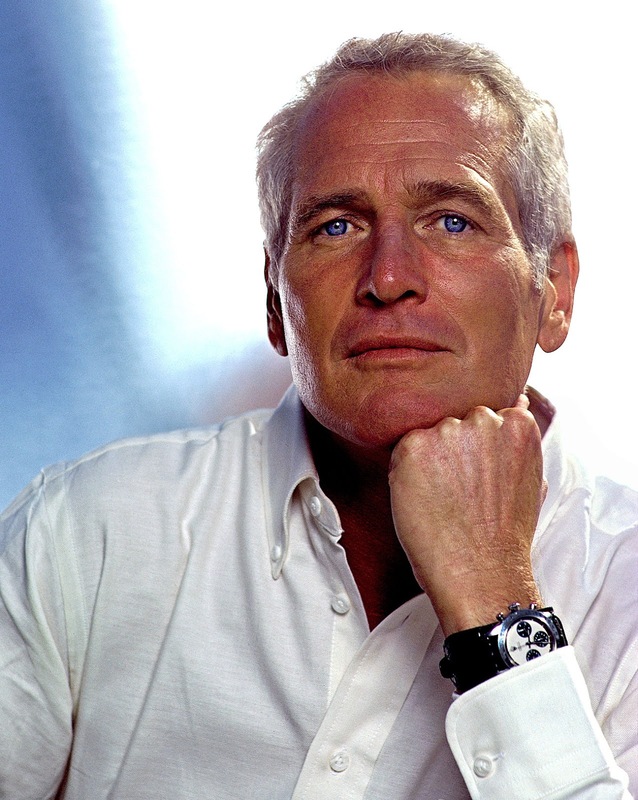 I remember how excited I was talking to Nell Newman, and I was so happy to learn Paul Newman's watch was not lost to antiquity, but was safely being prepared to come to auction in the future. 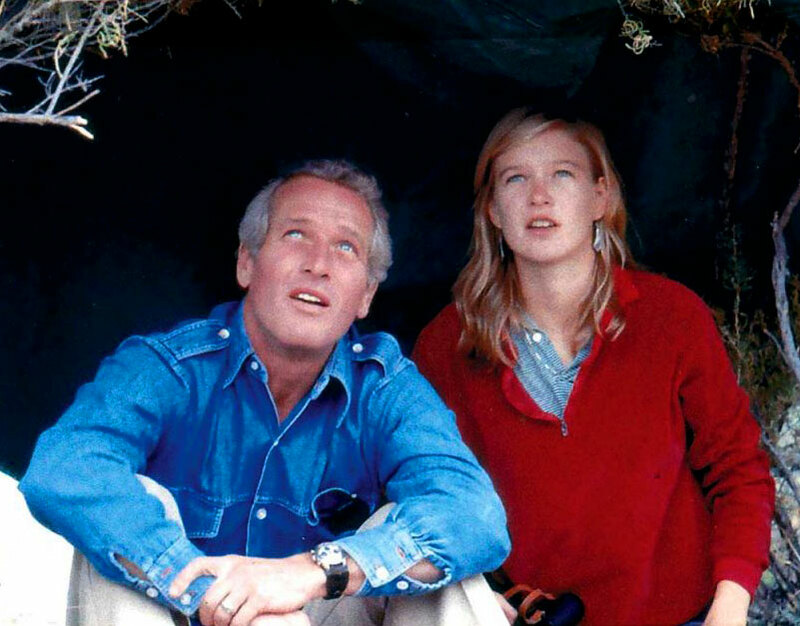 Nell is pictured below with her father, Paul Newman and notice he is wearing his exotic dial Daytona. Nell told me most of the proceeds would be going toward her Nell Newman Foundation. 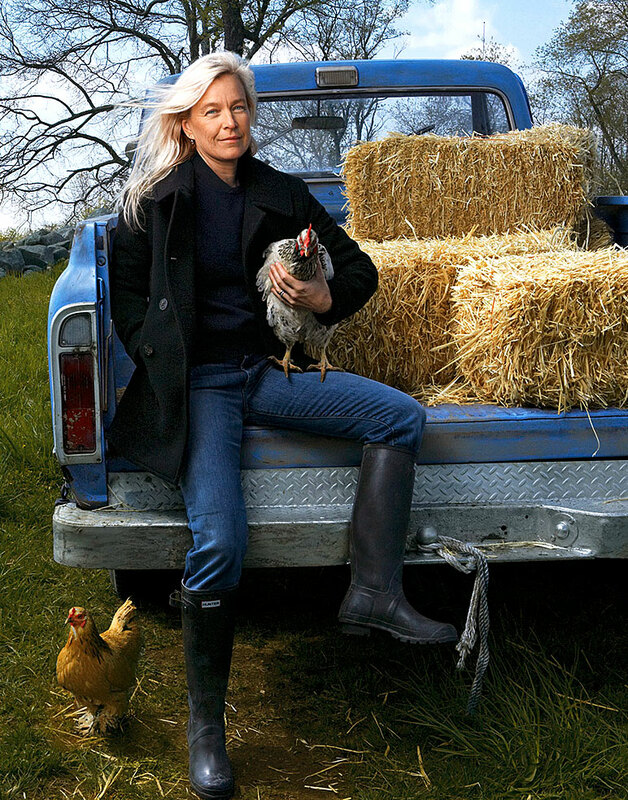 Nell Newman is pictured below in a photo from Vanity Fair that was taken by Annie Leibowitz. Nell Neman shared the story with me, about how back in 1985, her boyfriend, James Cox spent the summer staying with the Newman family. James asked Paul Newman what time it was? Paul responded: "It's a hair past as freckle". 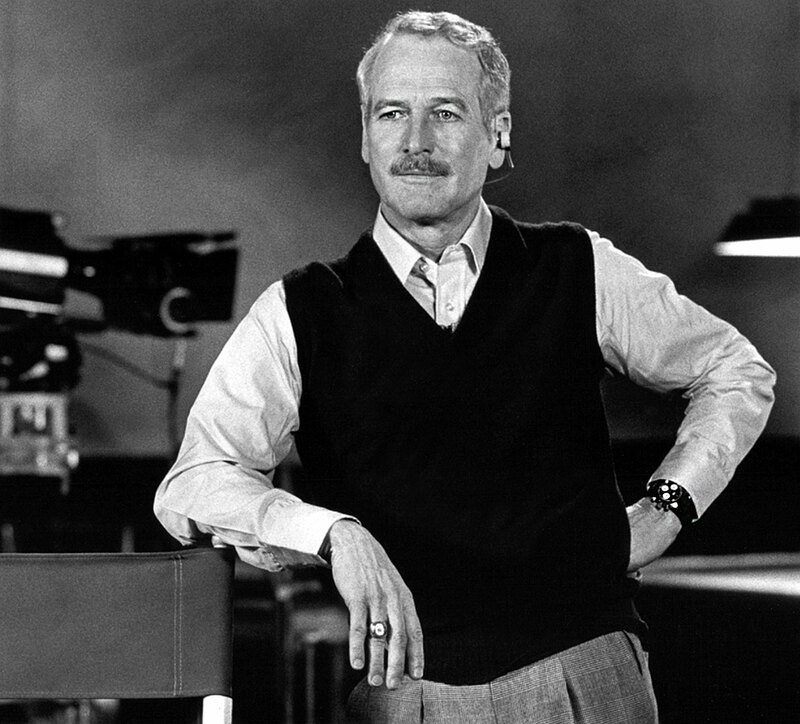 Nell continued, "Then Pop (Paul Newman) asked James why he wasn't wearing a watch? James said he didn't own a watch, so Pop took off his exotic dial Rolex Daytona and handed it to James, and said: 'You should have a good watch, so you always know what time it is.'" I responded to Nell and said, "Wow!?!! That's crazy, your father just handed your boyfriend a watch that today is likely the most valuable watch on planet earth!!!!" 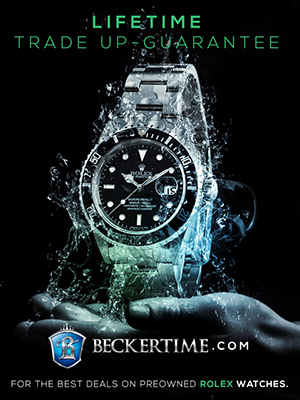 Nell responded: "That's the thing Jake; back then Rolex watches were not that big a deal. I mean, yeah, they were nice, but they were not considered to be anything like they are today." 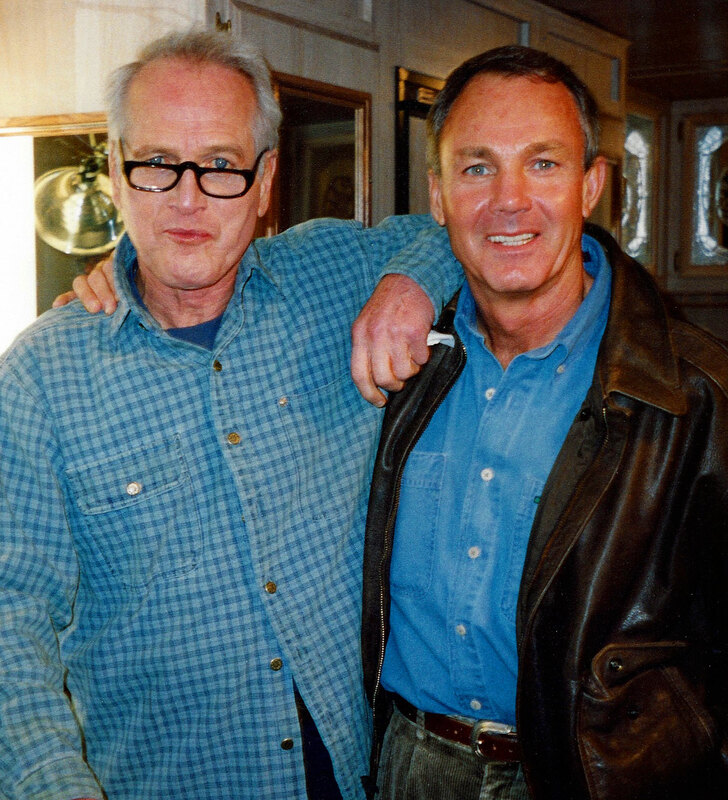 I was introduced to Nell Newman by Stan Barrett, who was Paul Newman's best friend and is pictured below with Paul in 1974. 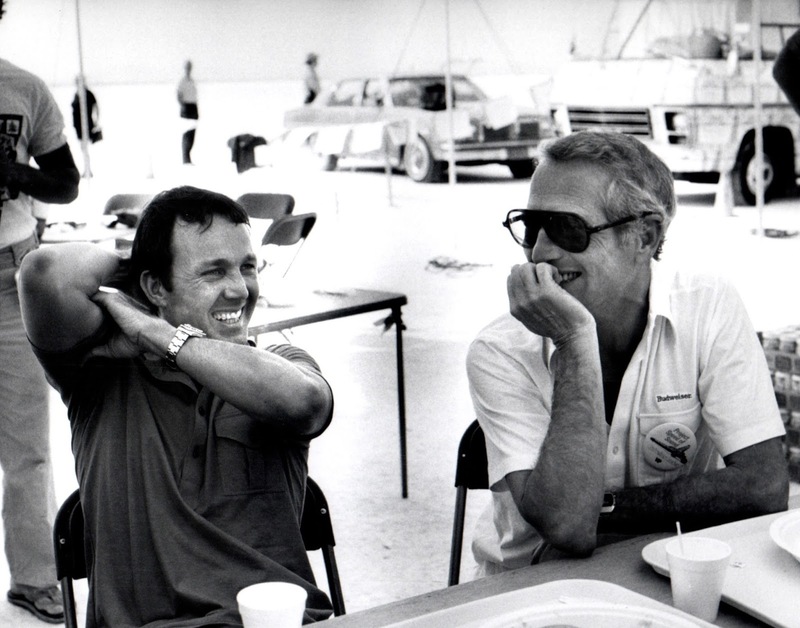 Notice Paul Newman is wearing his exotic dial Dayonta in the photo and Stan Barrett is wearing a Pepsi Rolex GMT-Master that Paul Newman gave Stan as a gift. I originally wrote a detailed story about Stan Barrett, and we ended up becoming great friends. 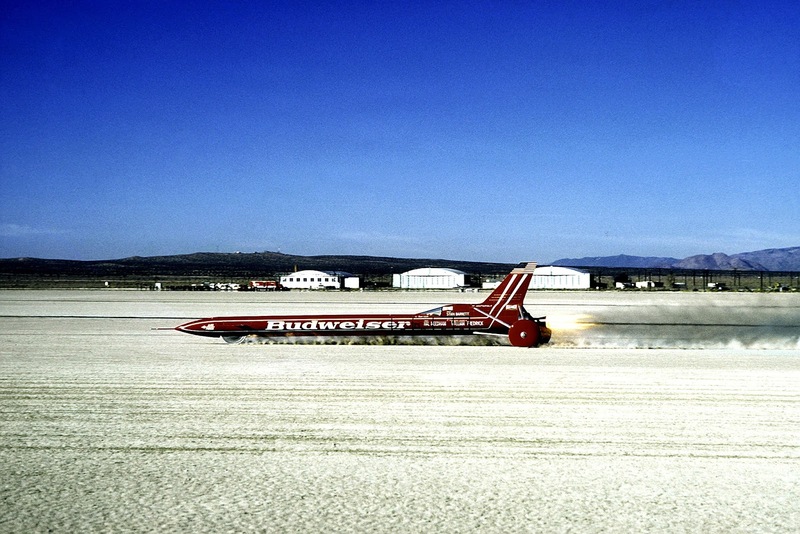 It's weird to think I have become really great friends with Paul Newman's best friend, but hey, I guess that is one of the great benefits of being the worlds leading Rolex historian ;-) Stan Barrett is pictured below with Paul Newman at a barbecue lunch, when Paul came to check out Stan's Budweiser Rocket car. 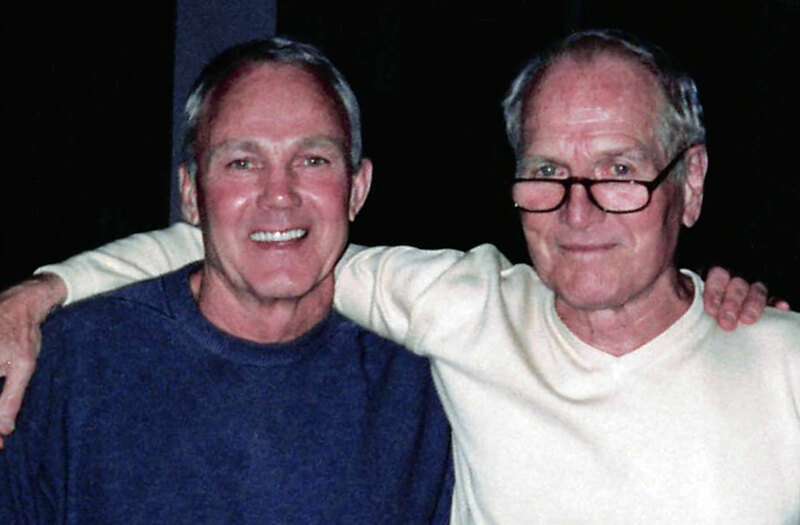 Paul Newman and Stan Barrett were BFF's up until Paul Passed away. 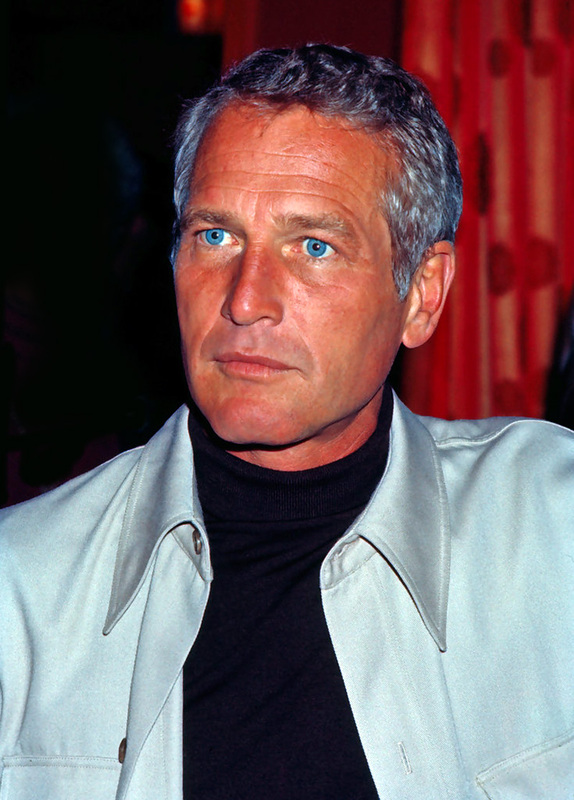 People often mistook Stan Barrett for being Paul Newman's son, as the two look so similar. Paul used to kid Stan, and introduce him as his "illegitimate son." Later this year, I will be publishing a detailed video interview with Stan Barrett. 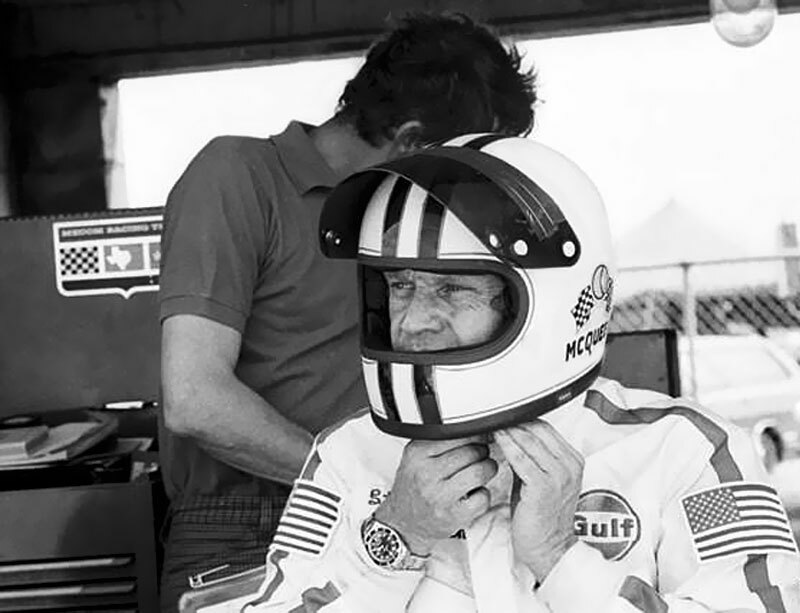 Stan Barrett was Paul Newman's stunt double in many, many movies and Stan Barrett was also a leading explorer in the art of motorsports, which lead him to shatter the world land speed record in 1979, when he drove into the history books as the first man to travel on land past the speed of sound. "Hey Kid, be sure to wear this Rolex Daytona, it will bring you good luck!" "I don't believe in luck!" "Wear it anyway! I love you and I want to see you set this record, but if something goes wrong, I would be destroyed if I watch you die. So I am giving you this Rolex Daytona so a part of me will be with you, and I want you to know this is the first time I've prayed in 50 years!" Just to be clear, the Rolex Daytona Paul Newman gave Stan Barrett is NOT the same Rolex Daytona that is coming to auction. The Rolex Daytona Paul Neman gave Stan Barrett as a good luck charm is a Rolex Reference 6262, which is pictured below in a photo that is being published in this story for the first time and is exclusive to Jake's Rolex World. 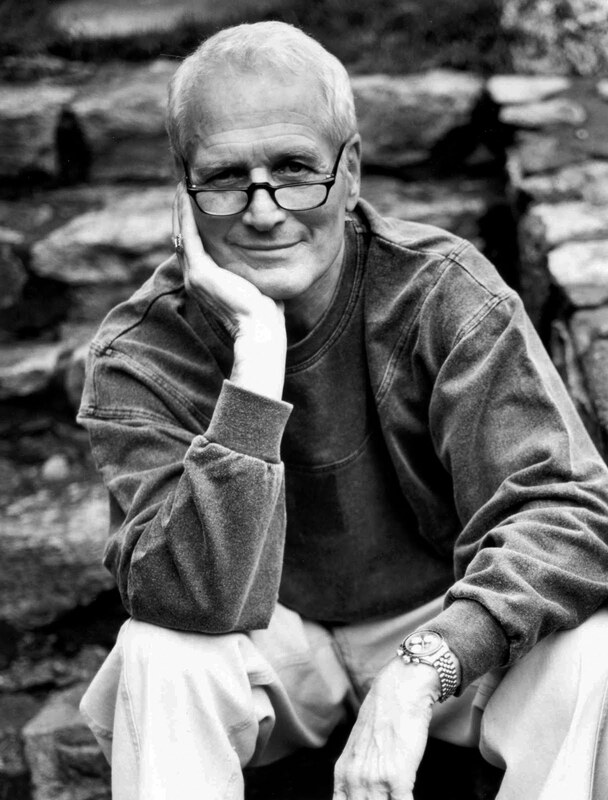 Stan Barrett is pictured below in a recent photo, and he really does look remarkably similar to Paul Newman. 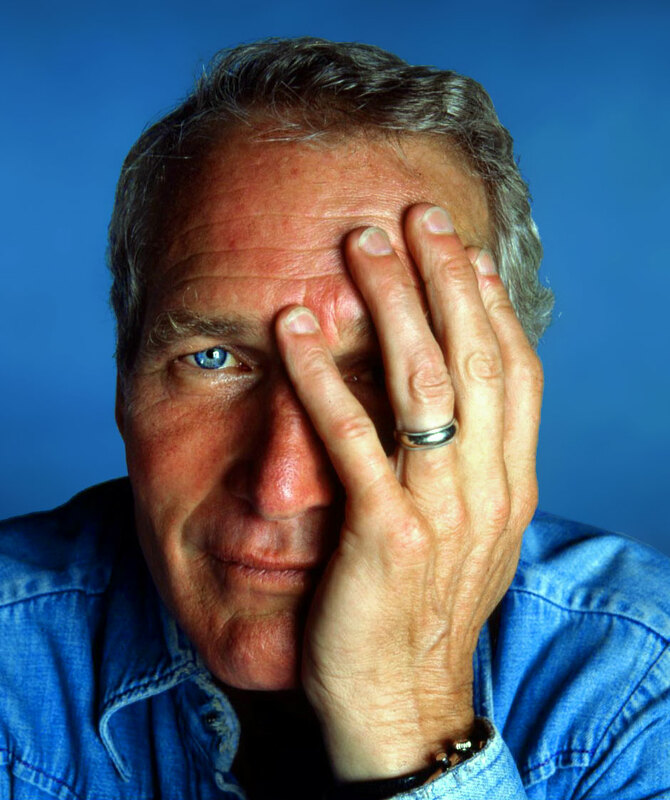 He is still wearing his Pepsi Rolex GMT-Master Paul Newman gave him so many years ago. So let's get back to Paul Newman. On Paul Newman's birthday, back on January 26, 2013, I was the first person to accurately make a positive ID on the exact exotic dial Rolex Daytona model Paul Wore, and it was based upon exclusive images I published as seen below. 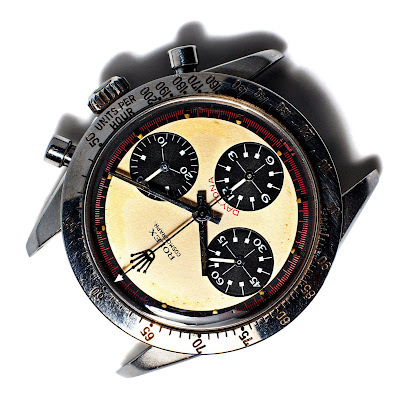 In 2013 I published the image above and below that showed Paul Newman's exotic dial watch, indeed was the version with the red micro-seconds dial track indices, along with the red DAYTONA dial designation, as seen below. 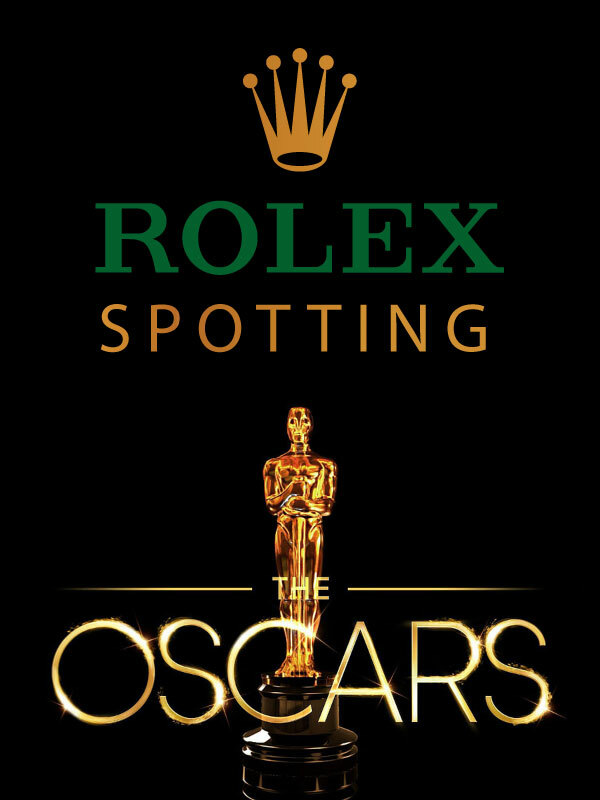 This may not seem like a big deal today, but back then it was a major Rolex history revelation that had been disputed my many. If you look closely at the photo below, you can vaguely see the red DAYTONA designation running around the top of the bottom center sub-dial. Many people assumed since the red color on the dial was not visible in previously published images, that it lacked this detail. I just about fell out of my chair when I discovered this tell-tale characteristic image. Just to be crystal-clear, and to offer an accurate frame of comparison, the watch pictured above in the 1970s is the same one pictured below in 2017. As previously mentioned, Paul Newman gave his exotic white dial Rolex Daytona to his daughter Nell's boyfriend, whose name is James Cox. James has owned and worn it ever since it was given to him in the mid 1980s, and it will be up for auction with Phillips Auction House in New York in October. James discovered that collectors, influenced by images of Newman wearing his watch, had renamed models with Exotic dials Paul Newman Daytonas. 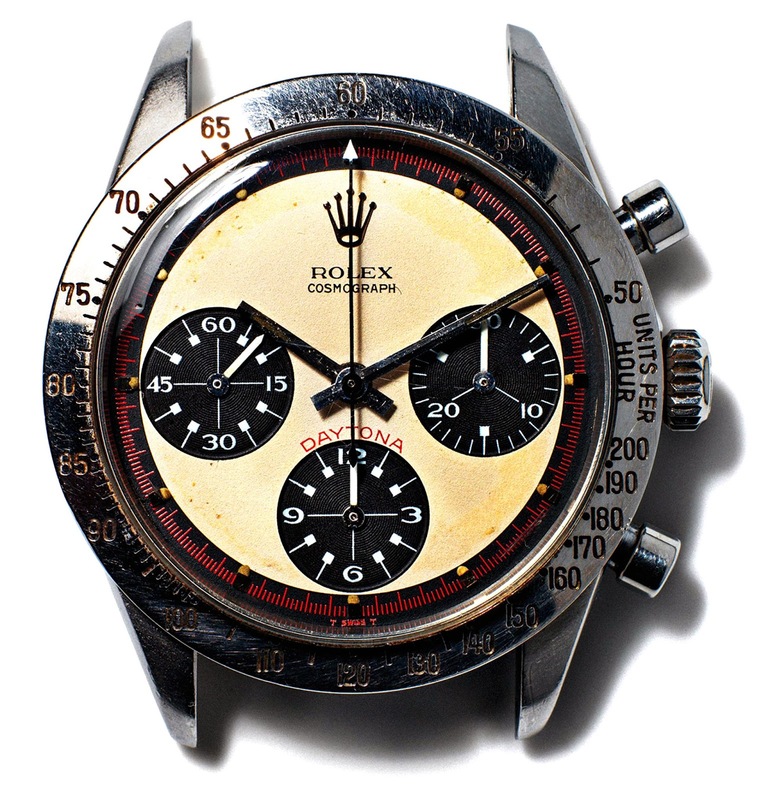 By the early ’90s, a 6239 Paul Newman Daytona garnered about $10,000 at auction. In May 2016, the auction price for a later reference hit $2 million. 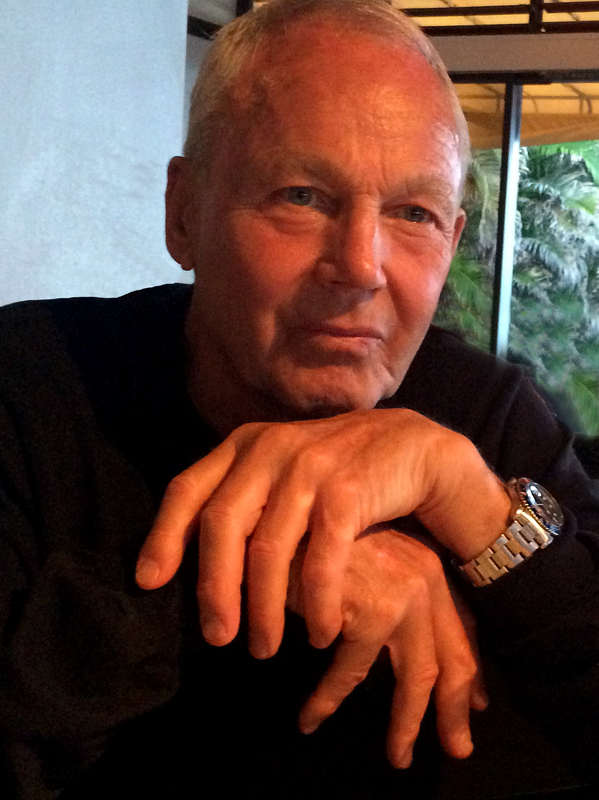 Unaware of the new price peak but wanting to do something for the Nell Newman Foundation—the charitable organization that Nell started in 2010, two years after her father died of lung cancer at 83—James (the foundation’s treasurer) approached Jeff Walsworth, a lawyer based in Irvine, California, for advice about possibly selling the watch. 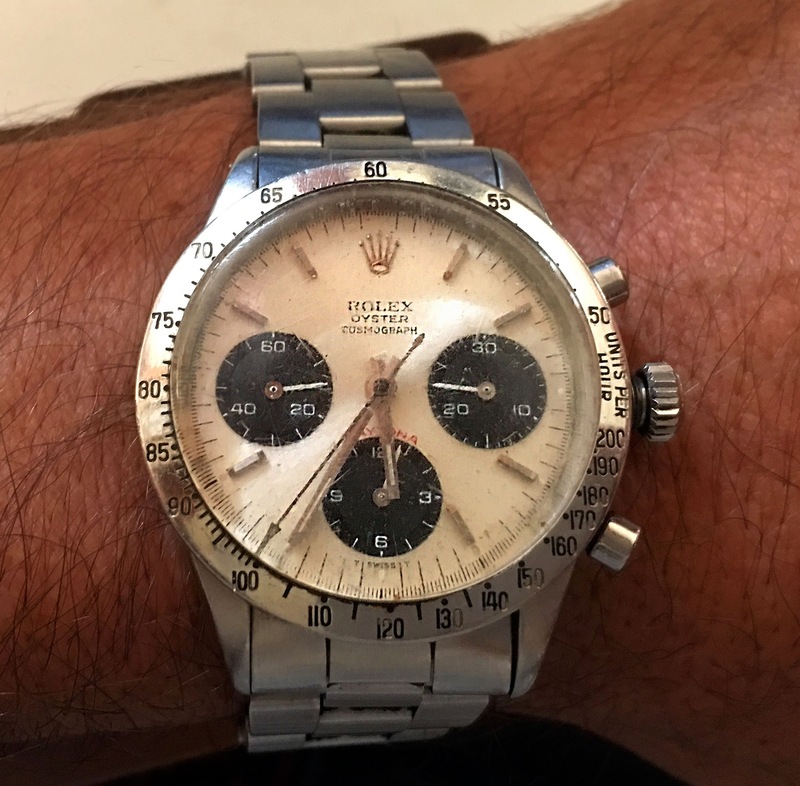 Walsworth contacted Tom Peck, a well-known California watch collector, and six weeks later James met the man responsible for that record Daytona sale: Swiss auctioneer Aurel Bacs. 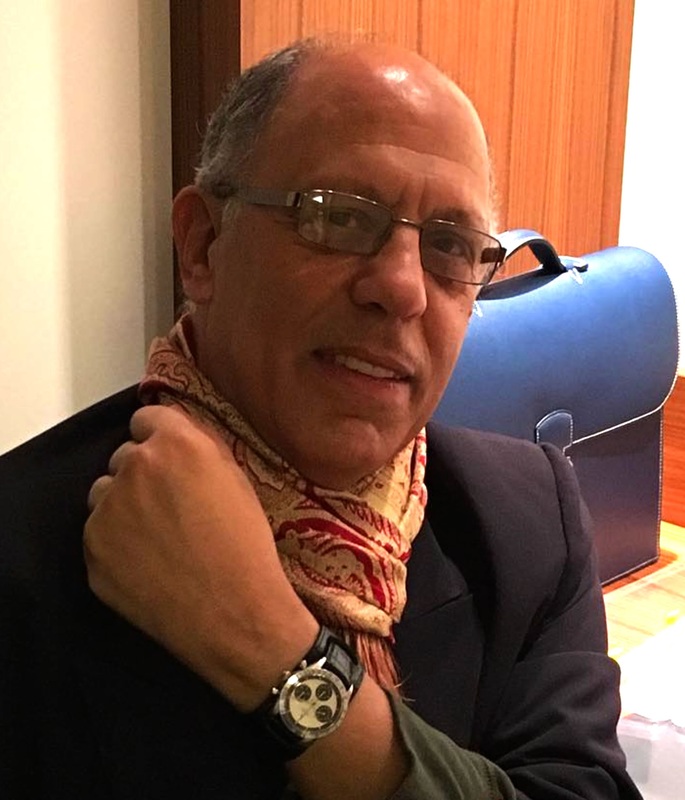 Bacs, a more than 30–year veteran of the vintage-watch world, runs the consulting firm Bacs & Russo with his wife, Livia, in Geneva, and works closely with the Phillips auction house. “The first question you ask when you get interested in vintage watches is, ‘Where is Paul Newman’s Paul Newman?’ ” Bacs says. “Everyone knows that by the mid-’80s Newman is no longer wearing it, and nobody knows where it is. 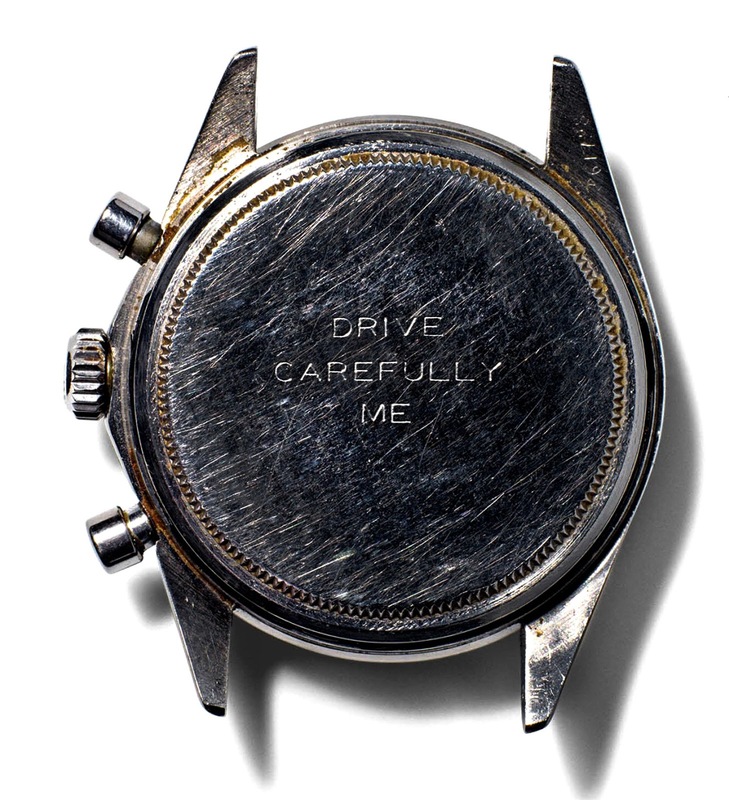 There is hardly a dinner with collectors where the conversation does not turn to this watch. Where is it, and how much will it make if it ever comes to market? Has he lost it? Is it in a drawer in Connecticut at the house?” During a dinner with James, Walsworth and Peck at a private club in Irvine, California, in July 2016, Bacs finally held Newman’s original Daytona in his hands. “He was about as excited as a Swiss guy in a suit could get,” James says. 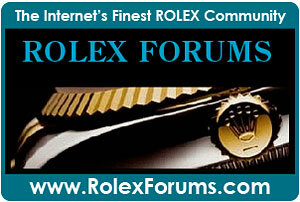 The question everybody is asking, is what is this special Rolex Daytona worth, or how much will it sell for at auction? In my personal opinion, Paul Newman's "Paul Newman Daytona" is the most valuable watch on earth. 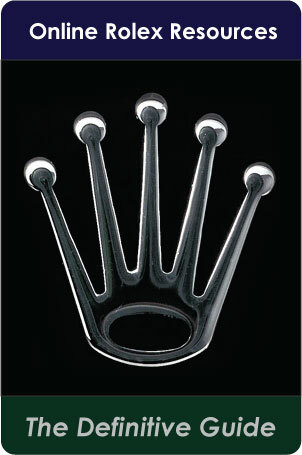 Notice I said, the most valuable watch on earth, not the most valuable Rolex. I think it will easily blow past $10 Million, and I could see it reaching upwards of $20 Million. 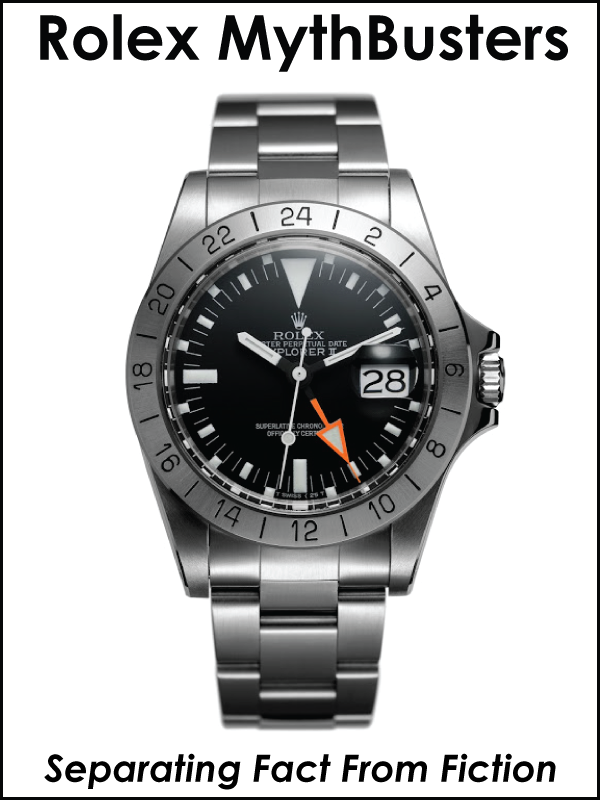 The provenance behind this super-iconic, beautiful watch is beyond remarkable. 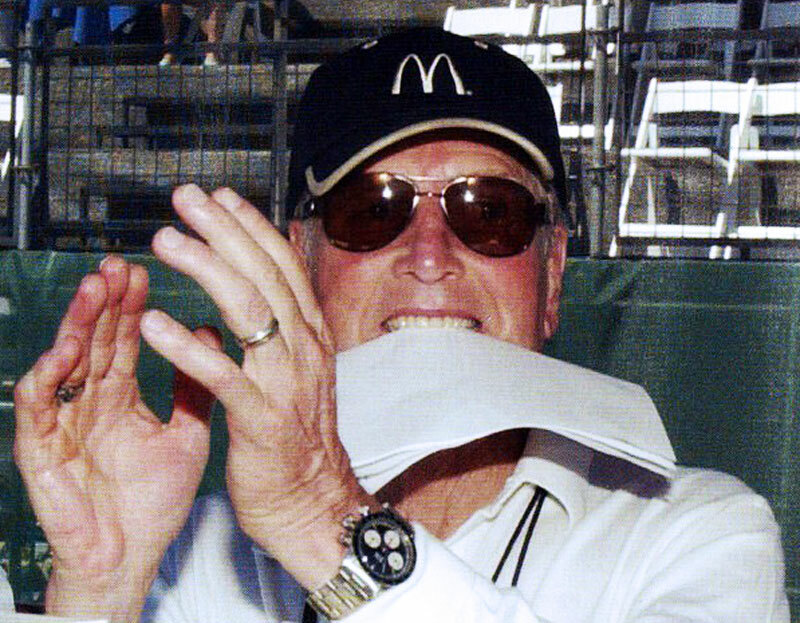 Paul Newman's Rolex Daytona is the ultimate vintage Rolex, and a significant portion of the auction proceeds will be donated to the Nell Newman Foundation, which is a non-profit organization Nell founded in 2010. I would like to thank The Wall Street Journal for providing the superb images of Paul Newman's Rolex Daytona watch with the Exotic White Dial. The Wall Street Journal published a great story on the history of this amazing Paul Newman Daytona, titled, "How Paul Newman's Legendary Rolex Cosmograph Daytona Was Found—and Where It's Going Now." 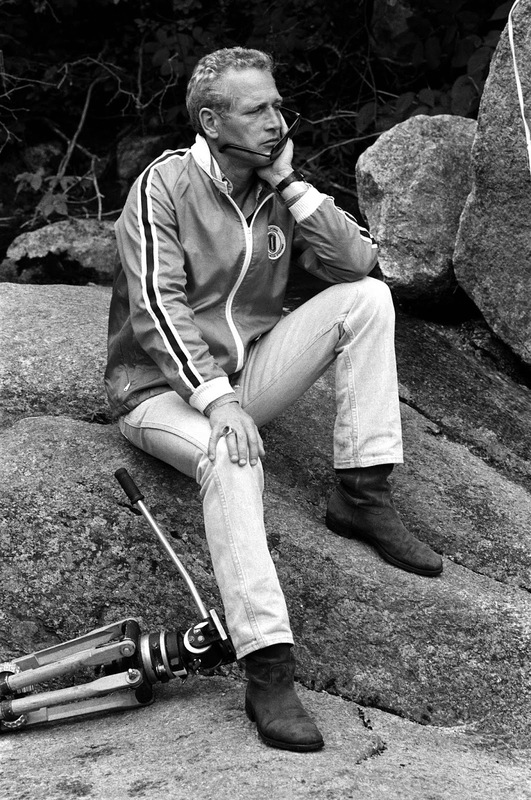 Below is a photograph of Michael Clerizo from the Wall Street Journal wearing Paul Newman's Own legendary Paul Newman Daytona. This exclusive photo of Paul Newman's Daytona in the wild appears courtesy of Revolution.Watch Instagram Page. 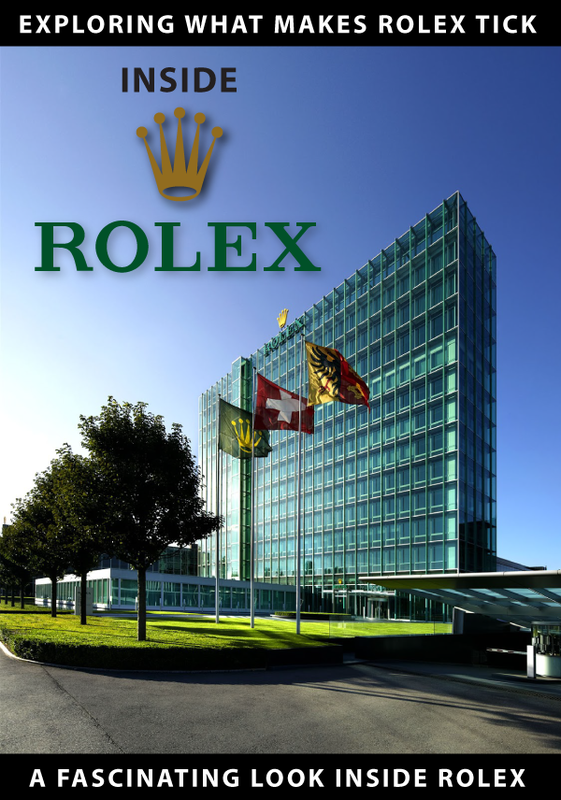 I would also like to thank Stan Barrett for all of his valuable insight and contributions to this story, as well as Nell Newman for sharing her insight into her father's brilliant Rolex History. I would also like to congratulate Aurel Bacs of the Swiss Auction House, Philipps for successfully landing Paul Newman's Rolex Daytona to auction. Paul's watch could not be in better hands. Paul Newman pictured above wearing his Rolex Daytona on a crocodile FatSrap, while wearing a denim shirt that was a gift from Stan Barrett.